You find all sorts of landscaping ideas on the web and on television, and many of them are geared toward certain climates or types of homes. But when it comes down to springtime and you’re ready to put those ideas to use, they’ve already escaped your mind. 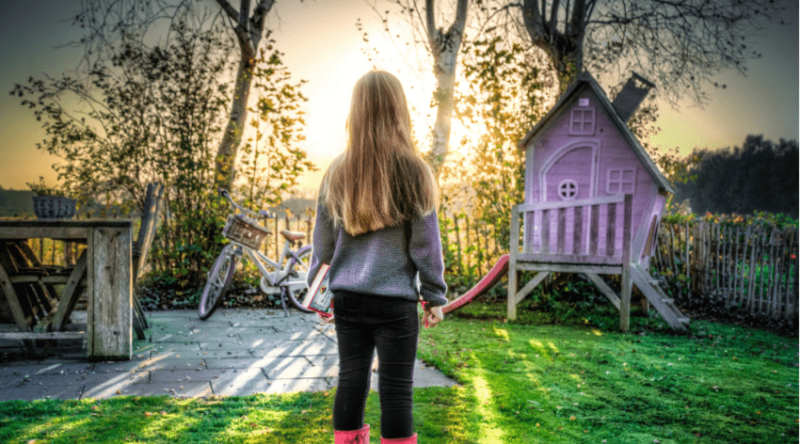 Instead of digging through your brain and mentally scrapbooking ideas, save this comprehensive list to inspire you for any type of yard. big or small, lush or desert, rich or poor. As you glance through the list, take away specifics, keeping elements you enjoy while dismissing those that don’t appeal to you. Shrubs and bushes are important elements in most landscaping designs, especially in front yards. In a sloped yard, set them in tiered layers and trim them to different heights, giving them greater depth. You can create an optical illusion, making some farther back appear nearer, or vice versa, depending on how much distance you want to visualize between the house and the sidewalk. In this space, you have neatly manicured shrubs paired with bushes that have been allowed to grow into trees, giving the organized space a sense of wildness. 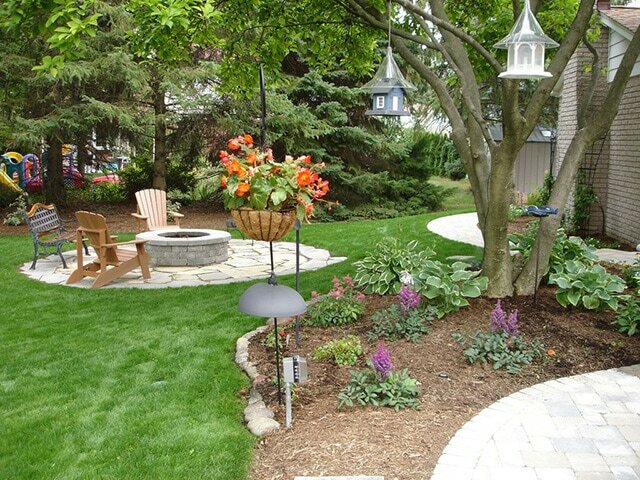 It’s a perfect match to assure your landscaping looks tidy and contained without removing all the whimsy of nature. 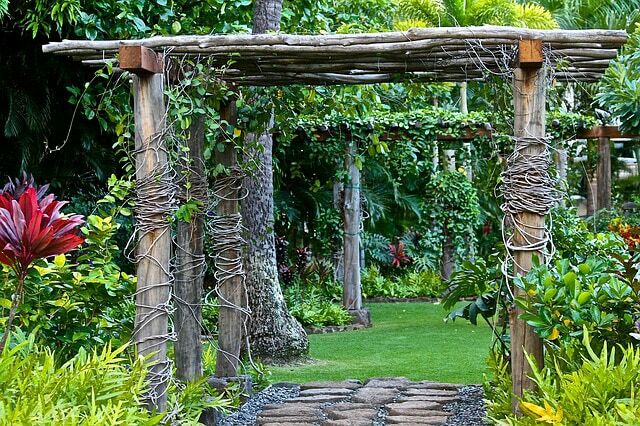 Add a patterned walkway for elegance and a little extra something that unites the green space. 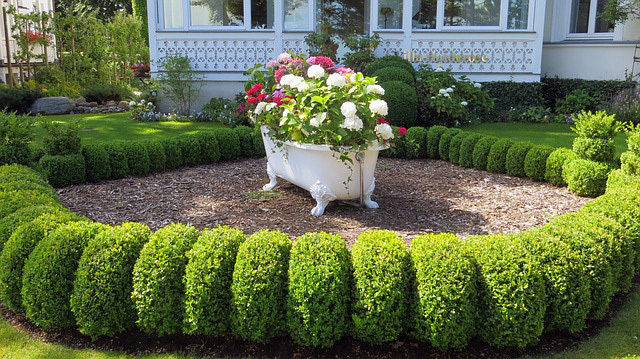 Using the claw foot tub was a genius idea for a flower pot, but who would really notice if it wasn’t the centerpiece of the landscape design? Sculpting the bushes around it into a circular pattern really brings the piece of floral art to attention and also draws the eyes to the owner’s creativity. Be sure to choose bold colors for the blooms amidst all the lush greenery. 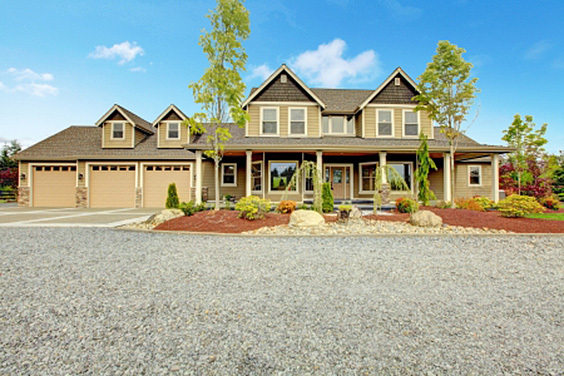 If your house is set back from the road, consider setting the elements of curb appeal closer, dressing up the driveway. 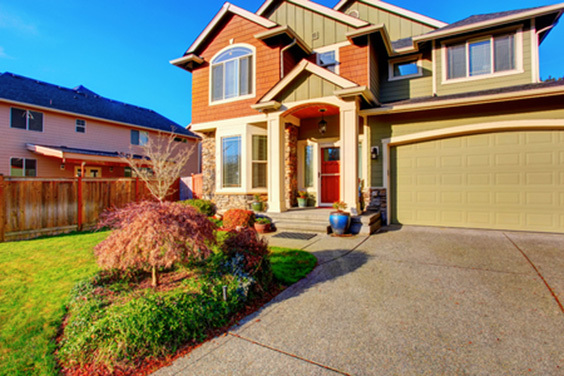 There are tons of driveway entrance ideas you can use, including trellises and archways, but to keep it clean and simple, have a tall shrub mark the way, and taper down to smaller pieces that line the way toward your garage entrance of front stoop. Sometimes, less is more. If you have a house that makes its own statement, just give it a little dressing to make sure it looks natural in its location. Frame the windows, using shorter plants and flowers under the windows and taller trees or bushes beside and between. 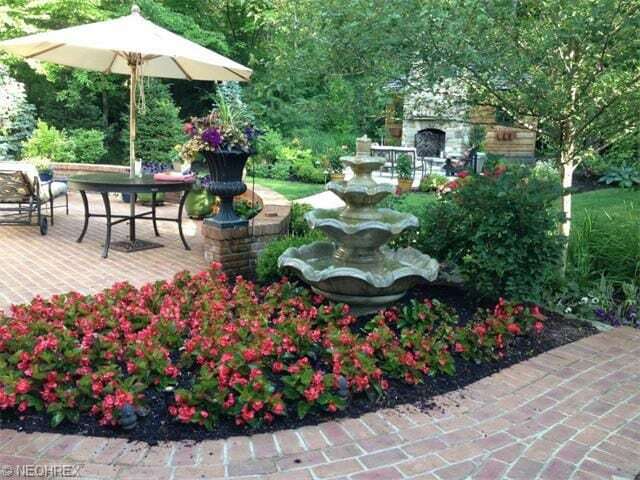 Depending on the color of your brick or stone home, you might consider a matching mulch in your flower bed as well. Some front yard displays are specialized and need proper care and attention from professionals. However, they really make a statement. This tree. 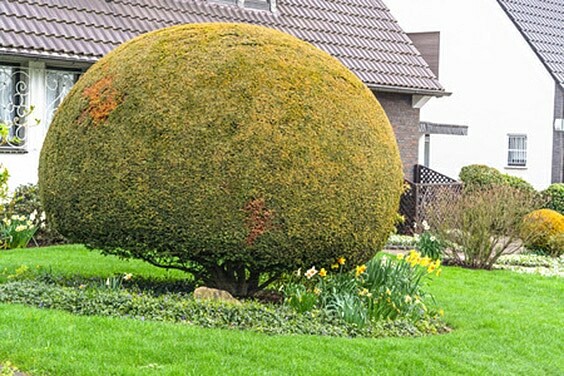 which grows more like a bush. is almost like something out of a fairy tale, and you’ll feel like something magical is taking root and pixies are dancing in your yard beneath the strangely intriguing shrub. 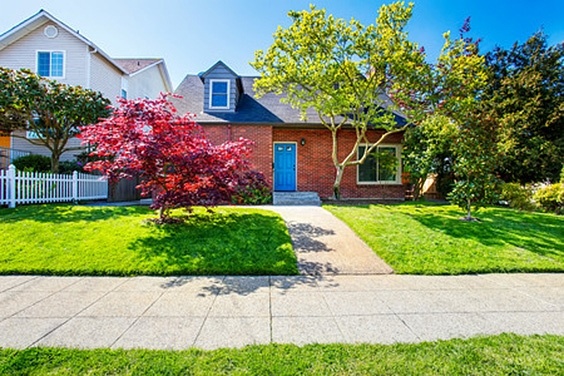 If you love the simplicity of a perfectly manicured yard but want to break it up a little, you could always plant a strip of easy care shrubbery between your yard and your driveway. Make sure you choose something with shallow roots, since you don’t want it affecting the concrete or gravel structure, and think about leaving some room for annuals to give a splash of color each year. Maybe you don’t want the hassle of greenery. You might actually have a black thumb. Perhaps you live in a climate that’s not conducive to growing green, blooming things. 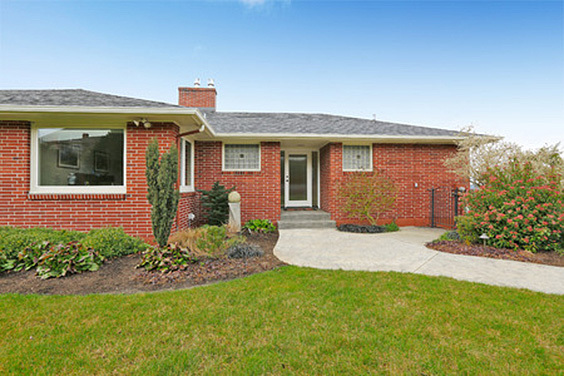 Whatever the reason, you can go completely urban, paving your entire yard in a lovely brick pattern. Brick pavers usually include some sort of image or pattern, and when it’s done correctly, will be as beautiful as any garden. 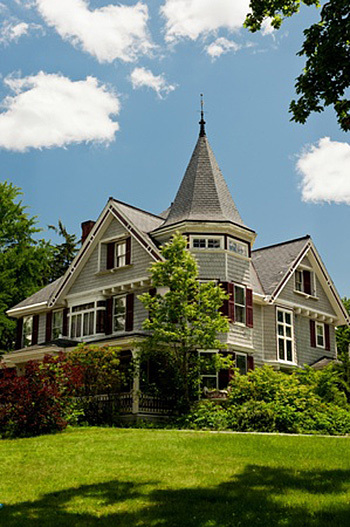 When it comes to sloped front yard designs, you have to consider the size and grade of the slope. 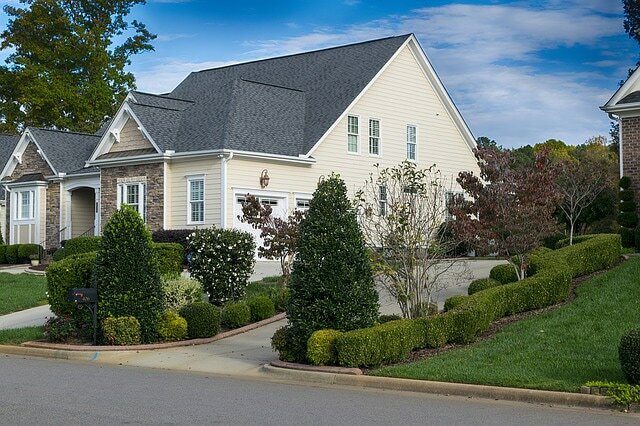 Here, a gentle slope has been divided directly in front of the house into two tiers, the back providing a modicum of privacy for the large front porch and the second adding splashes of color and texture to keep the shrubbery from looking monotonous. And it’s created a beautiful overall image. At times, the style of the home tends to dictate the imagination, and in this case, the fact that the house is a perfect sprawling gingerbread design, it lends itself perfectly to a simple but mysterious landscape creation. Small shrubs of various shades are peppered all along the front, and while you can see most of the windows, there are some taller spires that leave you wondering, what would you see if you could look through them? Especially when you’re dealing with a lot of glass, the ‘peekaboo’ effect can really be gratuitous. In this case, the design is not quite symmetrical, making it feel more natural, and the stairs are pronounced by the perfect choice of small shrubs. The trees seem to be parting so the house can look through and welcome home its residence…or question newcomers of their intentions! If you have a pet, backyards should include a separately fenced area where your dog can run and play without getting out or destroying any yard work you’ve done. Make it a privacy fence half wall so you can keep track of your dog while relaxing in your sitting area. This also helps assure that your dog can enjoy itself without constant interruptions from passersby. 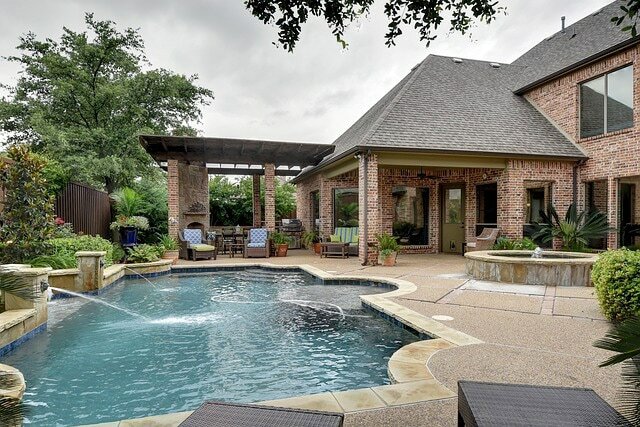 If you’re looking to work around an existing pool, one of the best means of adding a little uniqueness to your landscape is to change up your patio environment. Add some new furniture. perhaps a lounge chair or chaise. and a potted plant that gives the concrete design a bit more of a natural element. Ideas for small areas are hard to find, especially if you have a tiny nook that seems empty. A little reclaimed wood, a few twigs, and some rope can be just what the doctor ordered, and you don’t have to be incredibly crafty to build out something like this. Your garden gnomes will thank you. It’s a great conversation piece, too! Everything about this design will make you feel like you’ve stepped back in time a century to a bed and breakfast in the Irish countryside. The melding of lush vegetation, quaint furnishings, a cobblestone style paved walkway, and the water pump washbasin are perfect, and you’ll be flawlessly transported to another place and time when you enter your backyard. Sometimes, you only need a little passion for something and some time on your hands to bring it to life out in the open. Of all the ideas with pallets, this one may be the most creative, and best of all, it’s more than just an ornament. 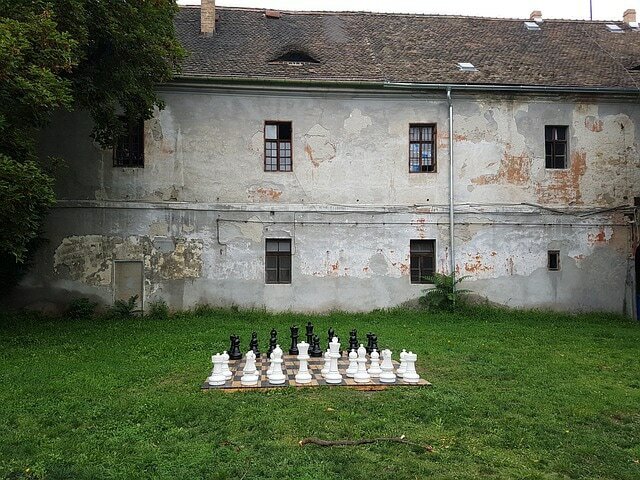 The full chess board could be played, and even children who have seen or read Harry Potter might like a game of Wizard’s Chess. I’ve seen a few different ideas with logs, but building a pergola pathway leading to some mysterious place beyond is reminiscent of the enigmatic questions around Stonehenge. It’s not that it’s difficult to build; it’s just shrouded in mystery and makes you feel like taking a journey through it will land you in a place of fables and fantasy. Not a lot of people think about creative landscaping ideas under oak trees, but you can really create a unique environment in this area of your yard. Plant small and varied vegetation as a base around the tree, and add potted flowers that can be carried in during the winter. Use bird houses and feeders in the tree both for aesthetic purposes and to attract some of the local feathered friends to your yard. Whether you have a big or small backyard, landscaping near a fence can really be helpful. 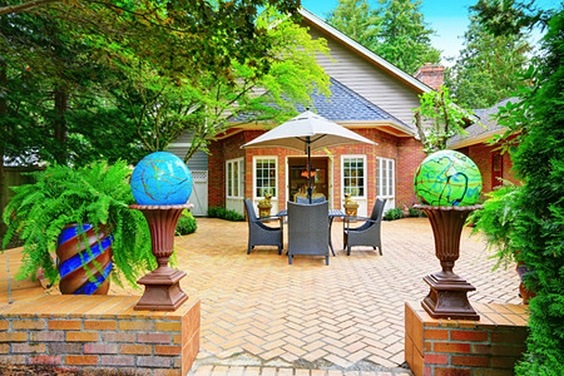 Ideas abound for the majority of the yard, but often, the outer rim is overlooked. Taper off your yard design by adding tiered layers of basic shrubs near the fence. 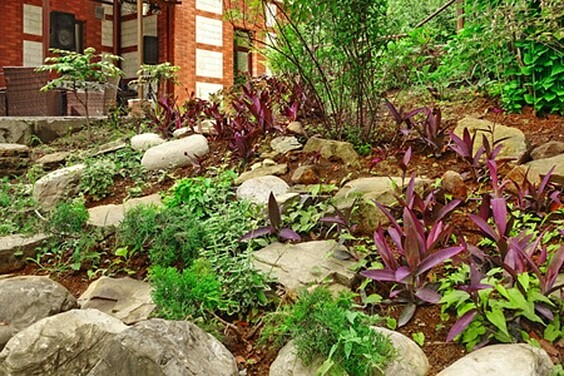 Use stone designs or larger, grassy plants to break up any monotony. 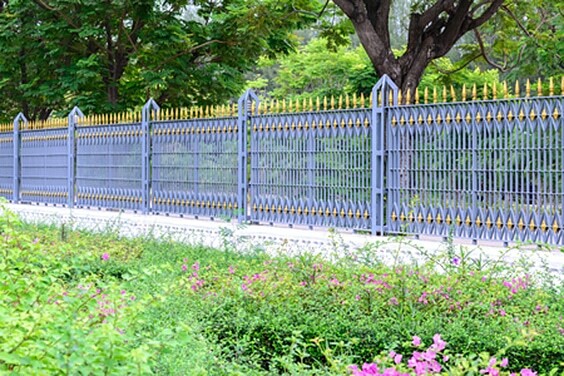 Blend vegetation colors to make the fence itself blend into the yard. Landscape design doesn’t always have to be about plants and natural elements. Sometimes, it’s the structures within the elements that make or break your design. Here, all the lighting blends in with the tones of the wood, the padding on the furniture, and the color of the fire pit. And the orange glow perfectly mirrors the beauty of the flames below. Just because you don’t live on a golf course doesn’t mean you can’t make it look like you have a stunning view of the back nine. This particular design incorporates some serious work to mimic the various greens, but there’s also a little tongue-in-cheek involved with the unusual visitor that seems to have started up the walkway. Maybe he’s come to return the water fouls. If you have an area of land that’s sloped, whether in front or back, you can remove the feel of rolling downhill by breaking it up into tiers. 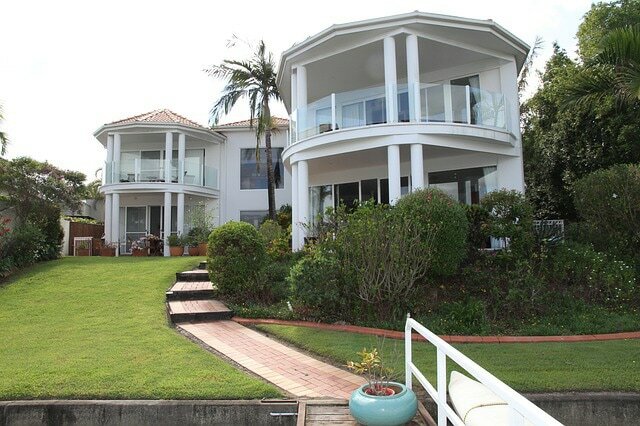 In this example, the tiered landscaping mimics the design of the house behind it. But with the use of leafy green plants, some stones, and perhaps a thatched awning over your patio or veranda, you can accomplish much the same appearance. Not all climates are created equal. 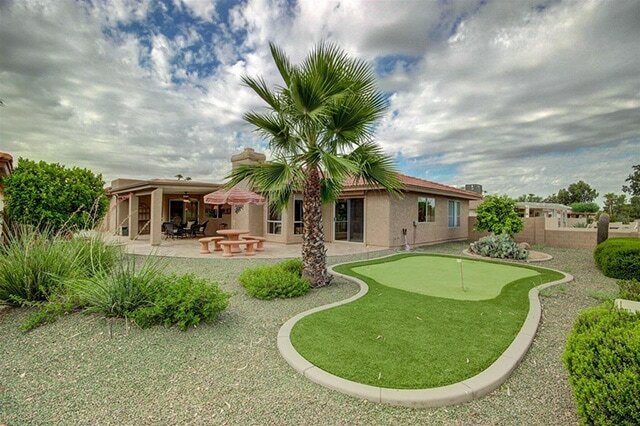 There’s no way you could live in the Arizona desert and have a lush mini jungle in your yard. 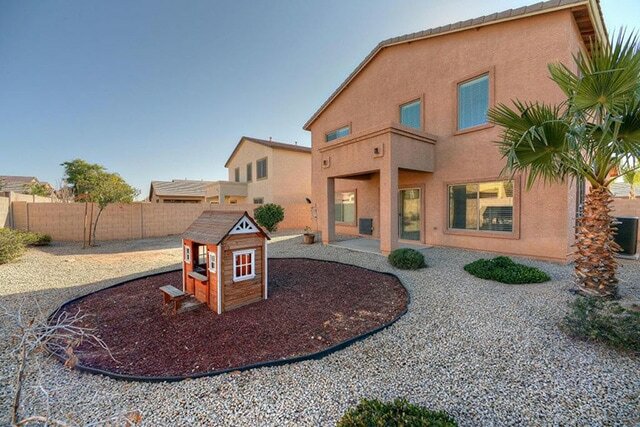 Instead, you have to consider desert backyard landscaping ideas. 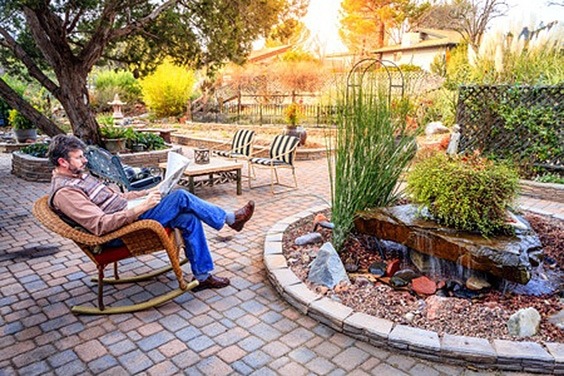 Try sparse vegetation that grows in desert environments, blended with stone, pebble, and concrete elements that can really be creative in your lawn space. If you’ve looked into decorative rock before, you’ve probably found that they typically involve a structure created from multiple rocks. That doesn’t have to be your choice of design, though. 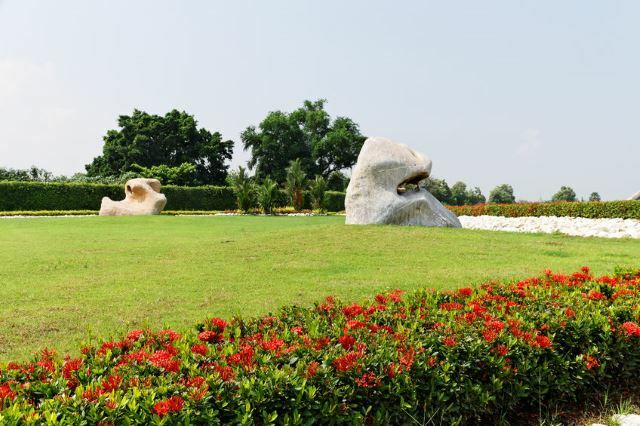 You could have one large rock jutting out of your landscape that really draws attention, or you could have a rock sculpted to a specific shape for your own entertainment. Who hasn’t played with the little Zen gardens you can buy at specialty stores? 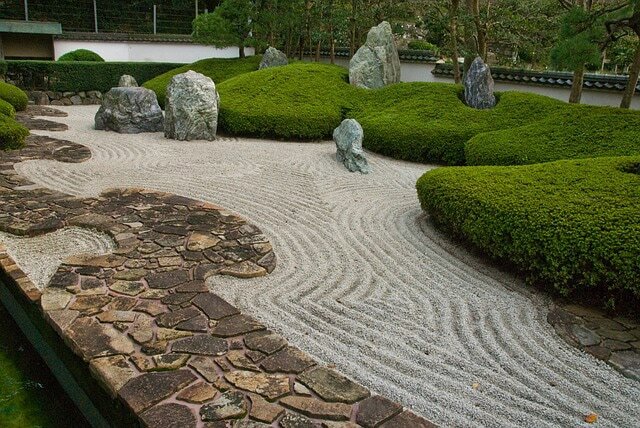 What if you could build your own Zen garden to a full scale in your backyard? 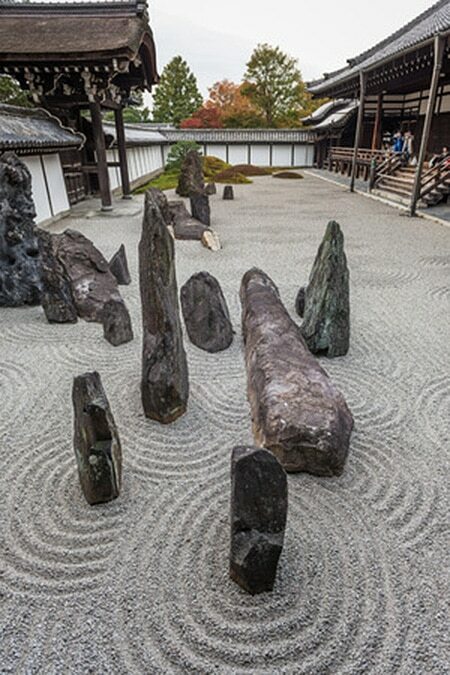 All you need are a few random Zen stones that can be arranged in an abstract pattern, as well as a little sand and a rake. This can be a relaxing meditative environment that looks beautiful and offers incredible stress relief. 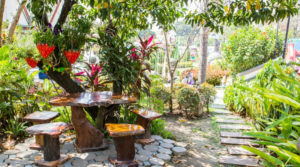 Parks are designed to incorporate both natural and urban elements, and you can build a similar space on a smaller scale in your yard. If you thought you could relax with a book or newspaper on a park bench, imagine how wonderful it would be to do the same in your own private space. 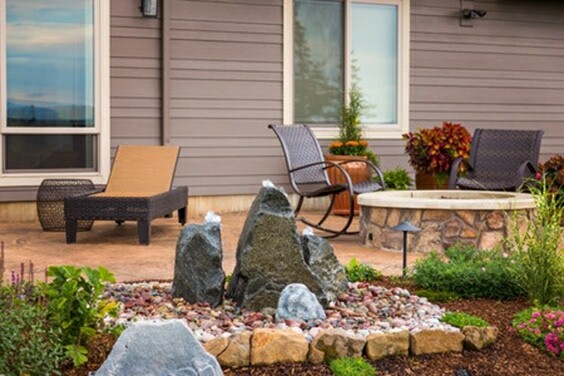 Whether you live in an area where green things grow easily or you have to rely on rocks and small shrubs to create aesthetic designs for your landscaping, you can install a simple water feature for decorative purposes. Choosing to make it bamboo, though, adds some peace and a certain nuance to the design. consider surrounding it with purple or deep toned vegetation, or you can have the water pour into a small pool that recycles through the pump. Landscaping is also about more than whether you plant azaleas or periwinkle. Sometimes, the most important elements are the subtlest. 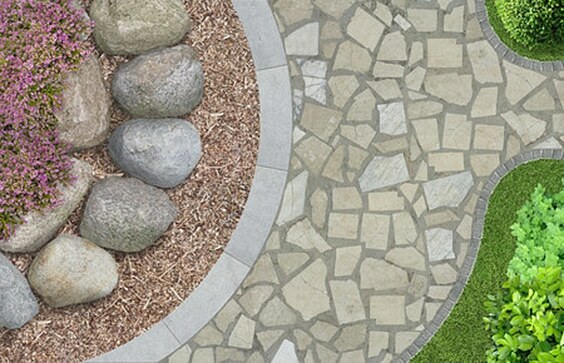 For example, the use of cobblestone paving, outlined by concrete bricks, complements the pebbles and stones used within the gardening patches of this design. the differences in shade are almost unnoticeable without a close up like this, but that small detail makes the entire area more lively. Not everyone is familiar with the term ‘hardscaping’ but that’s what happens many times in more urban environments. Many parks in New York and other urban cities are poured into concrete with little vegetation. 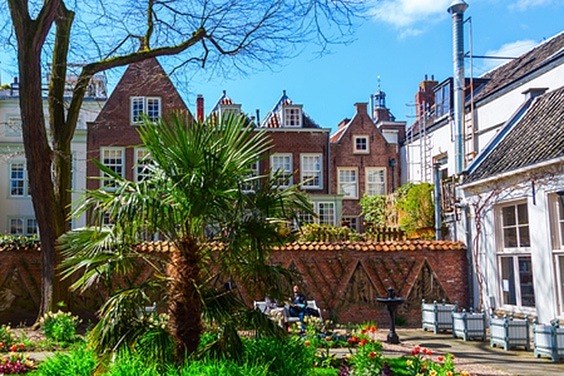 Of course, creating an urban landscaping design for your home probably includes more imagination than that, but you could literally build a parkour paradise with some bricks and stone slabs! Using the kind of rocks you collect used to be more difficult. 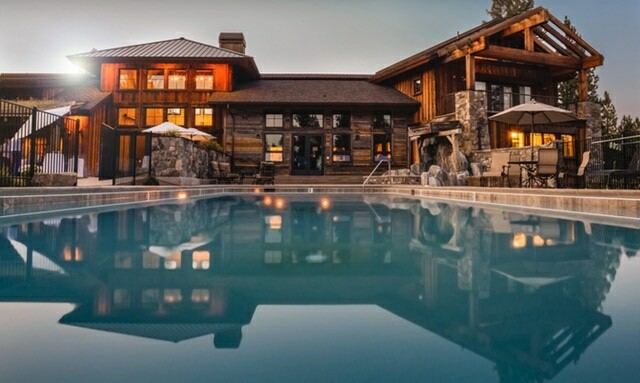 Now, there are creek rock landscaping ideas everywhere, since you can purchase the material rather than seeking it out with your own adventurous spirit. 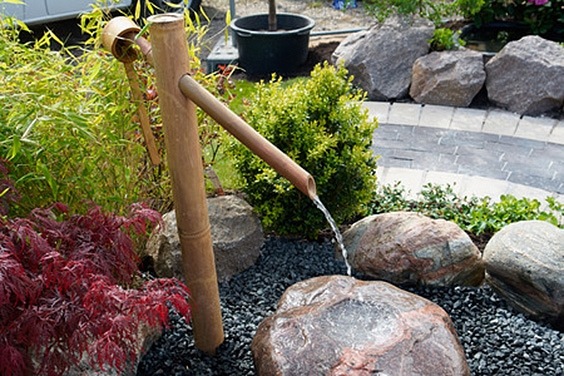 Use it to build up and decorate your koi pond. Or any pond in your yard, for that matter. Koi are optional! There’s always a use for repurposed pallets, and with the popularity of reclaimed wood, there is no shortage of landscaping ideas with pallets. 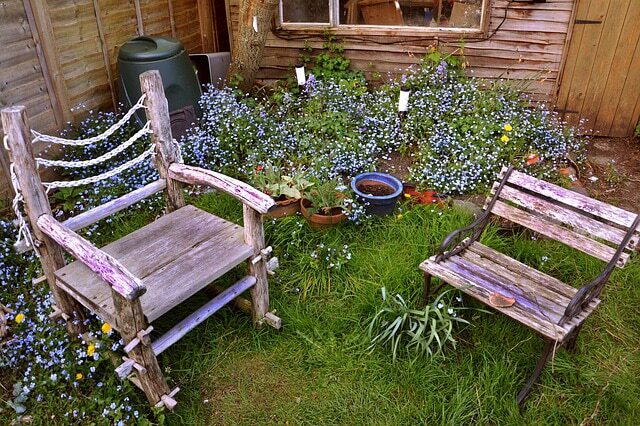 Here, though, is a simple way to make use of the boards to build a pretty little wooden bench so you can sit among the blooms in your garden and take in the incredible aroma. There’s nothing like nature to heal all things physical and metaphorical. Just because your house doesn’t sit on level ground doesn’t mean you have to surrender to your environment. Instead, unite the glory of living in such an austere location with the right elements to draw that rough terrain into your yard. 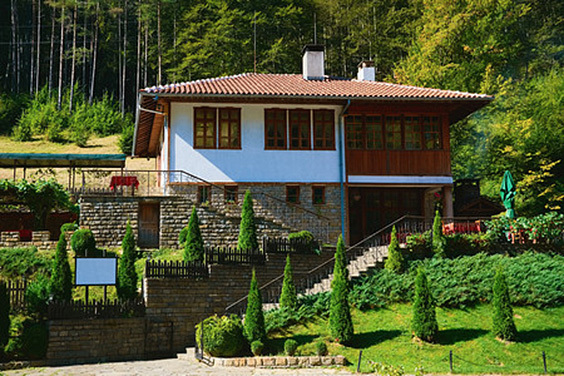 Use stone stairs, tall trees, and other steep hillside ideas to mesh the territory together, making your entire home. 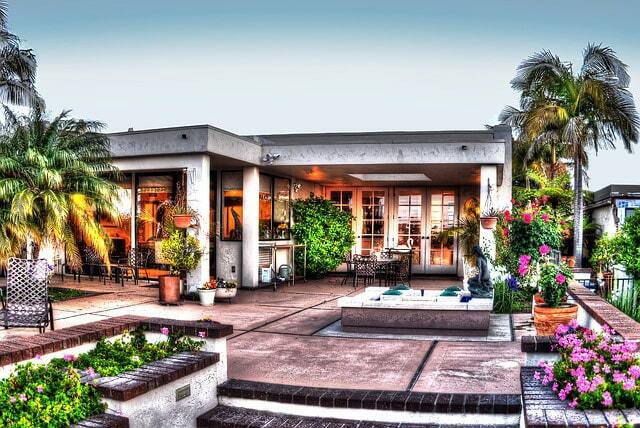 indoors and out. something awe inspiring. Not everyone has the benefit of a hilltop view of the city from their home. but if you do, take advantage of it, and consider an optical illusion effect. This pool, built on the hill, seems to be hovering on the edge and literally disappearing into thin air. 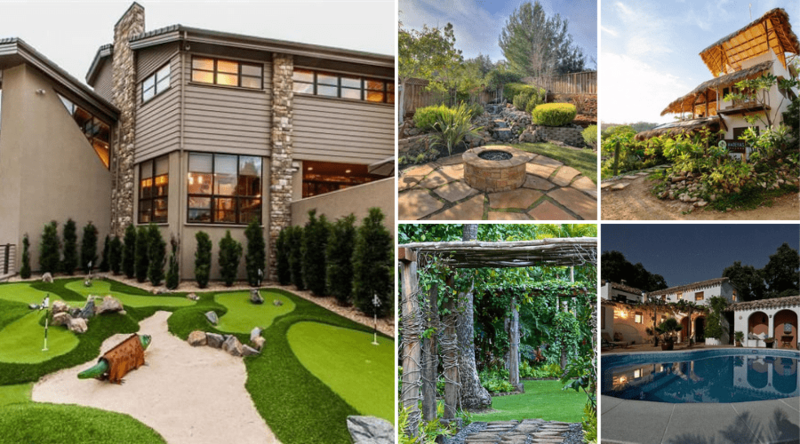 While this may be cost prohibitive for some, it can get the creative juices flowing so you can come up with your own one of a kind landscaping design. This is not your typical fountain. In fact, it’s more like a spout. But it’s a great way to add an element of fun to your backyard pool while also keeping the water fresh and churning. 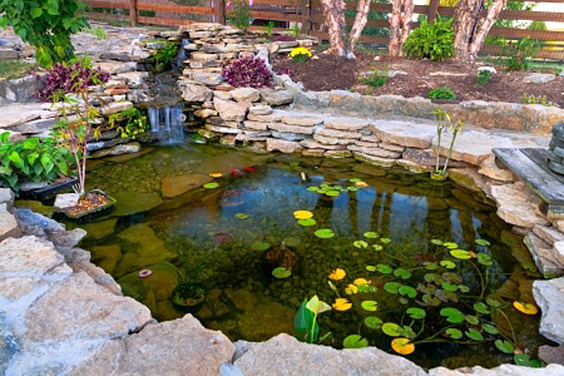 It’s especially worth the effort if you’ve created a pond style pool in your landscape design and want to have something natural. a turtle? a dolphin? spouting off at the mouth! 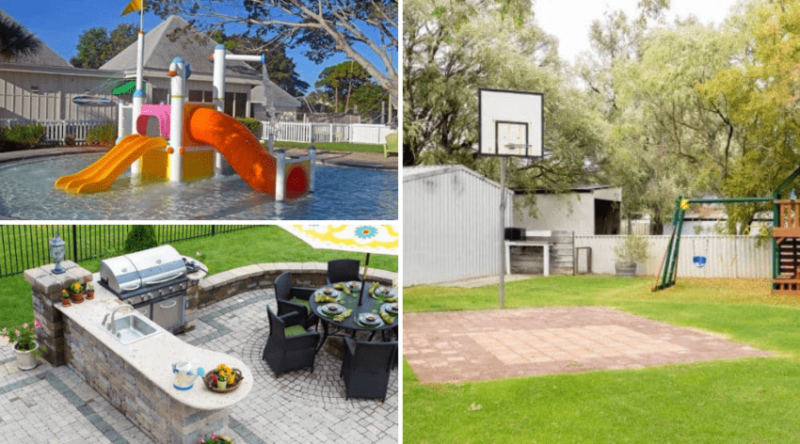 Maybe you’ve got a great setup for your backyard, with a lovely pool and nice patio furniture, but it’s just too hot and too bright to truly enjoy the outdoors. 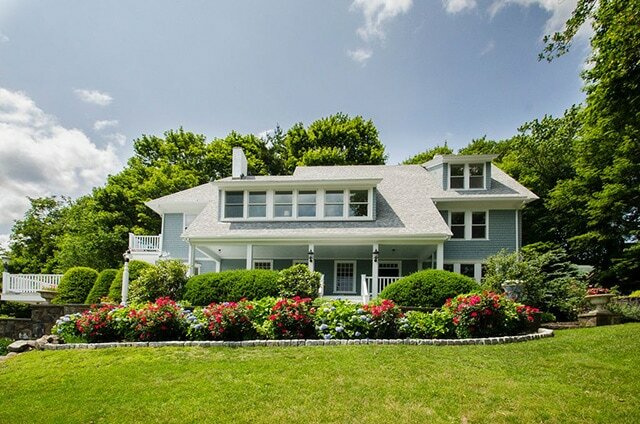 Now it may be time to look up for your landscaping opportunities. Building a permanent awning can relieve the sweltering heat and avoid nasty sunburns and potential for skin cancer! 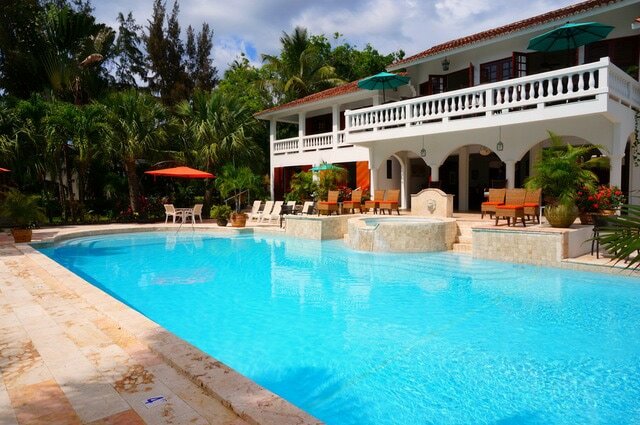 The white picket fence can really make your pool stand out, but it can serve a purpose other than decoration as well. If you’ve got young kids and want to protect them against the possibility of falling in, you can avoid the eyesore of an ugly metal number. It’ll also keep pets from jumping in and leaving behind mud, fur, and other unwanted dirt. With the right surfaces inside your pool, you can have the high end look of a mirror to reflect the beauty of your home’s structure in the dying light. The right ambient lighting can add to the effect, and a flat matte white landscape surrounding the pool frames it perfectly. 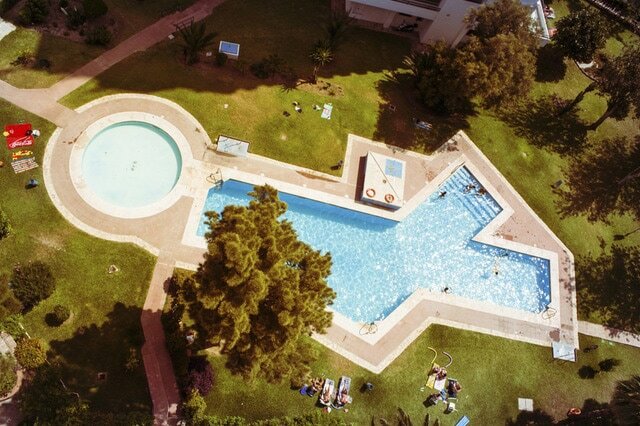 In this design, the pool itself almost disappears, and the world around the property is gone. It’s not just the landscape that is stark and modern, almost futuristic, in this particular setting. 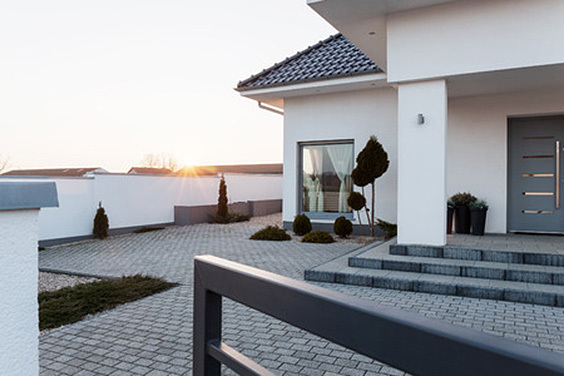 Of course, you don’t have to have the minimalist approach to your entire home to consider implementing concrete patio. But everything meshes here for the most utilitarian, stark appearance, all in lines and right angles with smooth, hard surfaces. And the crisp white furniture on the patio add just a small spark to the design. Then again, if we look closely at this setting, there really isn’t a clear ‘patio’ space. 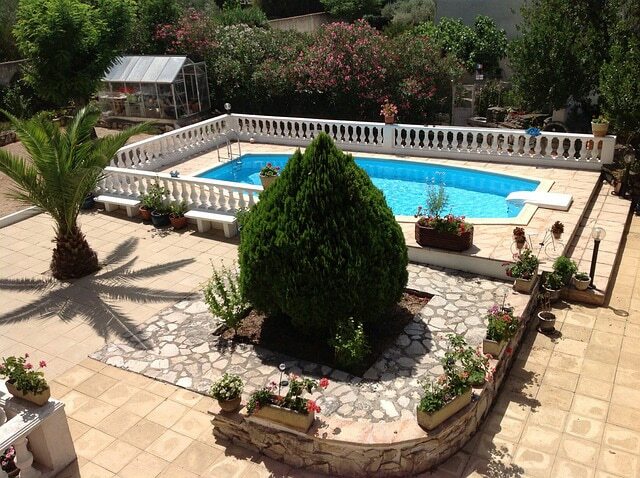 In fact, the whole area seems to be covered in concrete, aside from the pool. The ‘umbrella’, which is more like a pergola, creates the feel of a patio space that is separate from the rest of the landscape, a place for relaxation out of the sun without having to take a dip in the pool. Let’s face it. 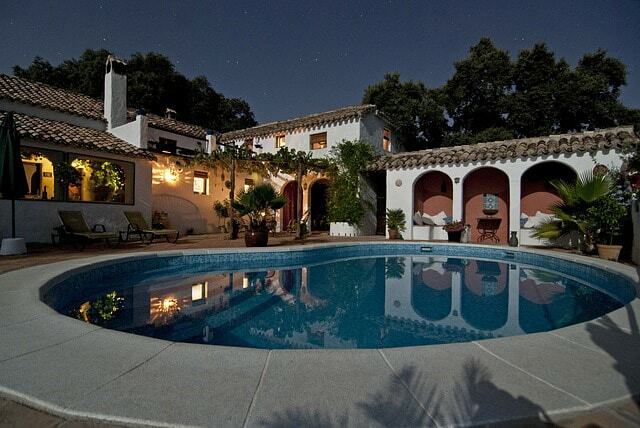 everyone dreams of having an Olympic sized pool in their backyard. 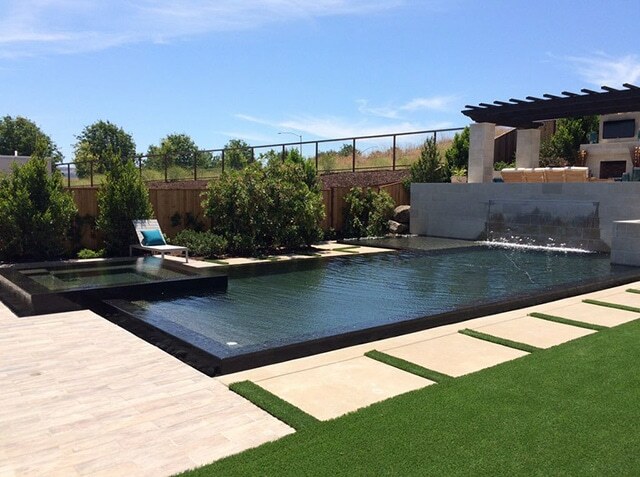 Most of us don’t have the space for something so epic, but it doesn’t mean we can’t incorporate backyard pools that feel just as powerful. 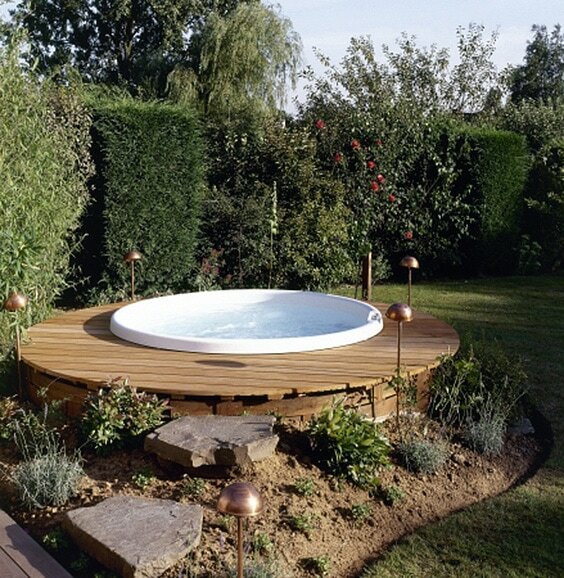 Cater to your space, and don’t let yourself get stuck in the idea of a rectangular pool. Get funky and abstract, making the most of your area and having something unique for an aerial view. 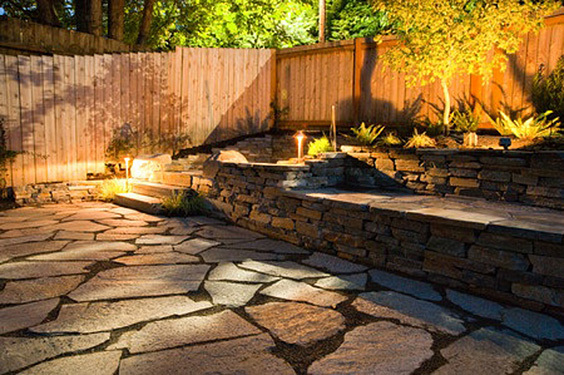 Believe it or not, it doesn’t take much to give your backyard area its own luminescence. With the right kind of lighting. and a choice of a soothing color like the blue here. you can have a night time glow that keeps it feeling like evening while still allowing you to see what you’re doing. And the soft yellow lighting around the pool will make your dip in the pond even more exciting. Have these people brought their beds outside to rest beside the pool? Who knows? 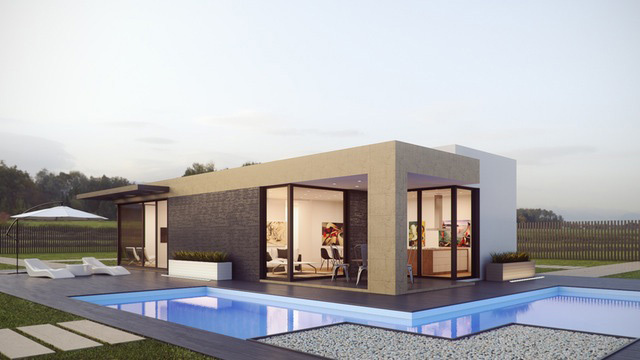 What you can see is that the form of the house, the shape of the pool, and all the elements that go along with each (including the color) are in sync. The beds-slash-loungers even blend. The only real stand out in the crowd is the line of shrubs along the fence, a beautiful natural element amidst the very contemporary design. Privacy settings are for more than computers. 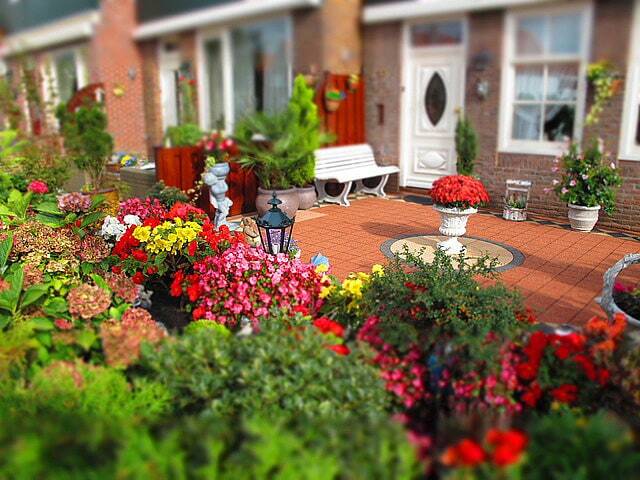 While you may want to show off your landscape ideas to your neighbours, you don’t necessarily want them spying 24/7. Retainer walls can help ease the feel of overexposure for the back and front of the house itself, and lining tall, thick shrubs that grow like trees really helps cordon off your individual space. If that doesn’t help you feel at peace, you might want to move to Fort Knox. So, palm trees aren’t natural to all areas of the world, but if you have an environment where they can grow, have some brought in! When it comes to palm trees, and regardless of how your home or garden is designed, a few palm trees can be a really interesting addition. You don’t even have to find the tallest ones for them to look majestic against the backdrop. 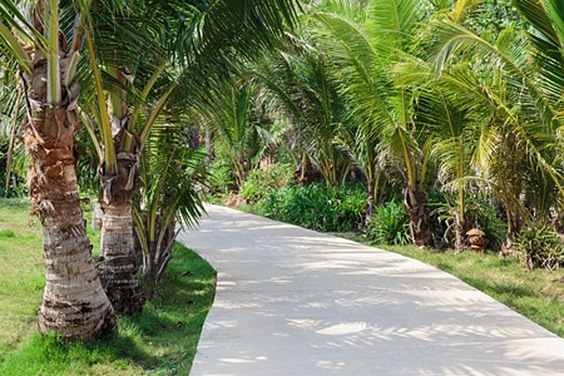 As mentioned above, landscaping ideas with palm trees are everywhere. 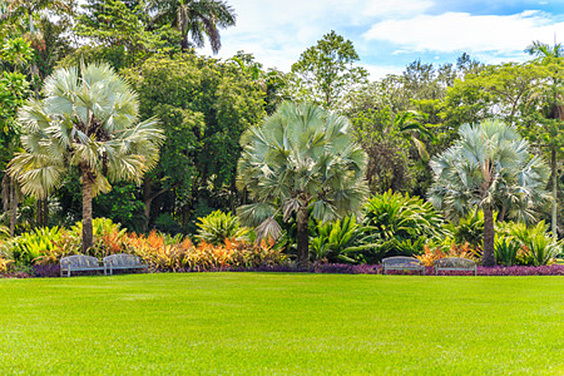 Here, you see the value of finding small shrubs and bushes that grow with the same spiky leaves that mimic the palm fronds to plant at the base of your palm trees. 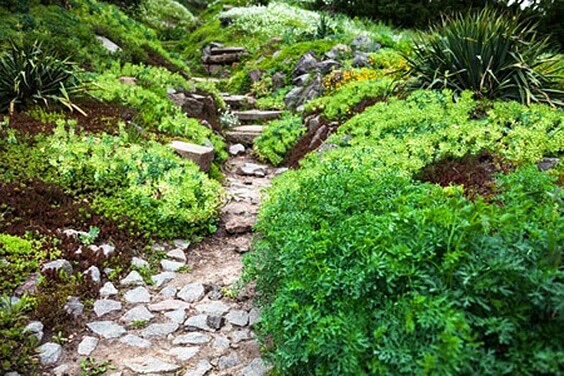 With these tall, stately arbours, you don’t need a lot of other green elements, and you can stick to small patches in the midst of tons of hardscaping. Another excellent thing about palm trees is that they don’t need shade but can provide it. 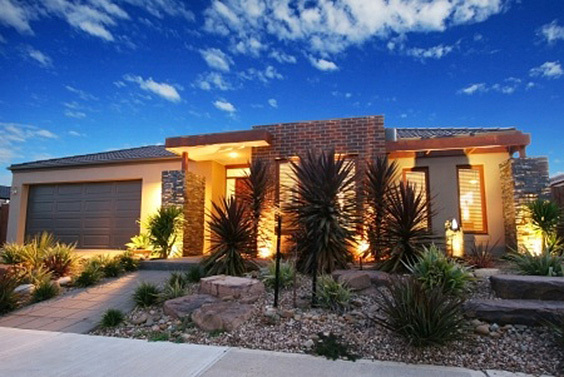 So, you’ll find a lot of ideas for the front of the house with full sun that play on the use of palms. They will continue to thrive, with a little care from you, and they’ll even help provide a bit of shade from the sun at its highest point of the day. Sticking with landscaping ideas for the front of the house, consider taking a small space in the center or off to the side and growing one of the shorter, thicker breeds of palm tree, with tons of smaller fronded plants surrounding it. You don’t even need to worry about grass, since you can mulch the area and get great results, as long as you can keep the base dry. Now, wouldn’t you feel like you were driving up to a Hollywood mansion every time you pulled up your driveway if it was lined with palm trees like this? Granted, you would probably need to look into some other landscaping ideas with shrubs to fill in space between the trunks for a perfect appearance, but the aesthetic beauty is only half the joy; the impression of living among the rich and famous counts, too. The deserts in California may have some seasonal rain, but you can never guarantee your yard will get everything it needs. So, many people have taken to hardscaping rather than landscaping. Really, there are just as many design options here, if not more, so you can get super creative. Maybe you’ll leave a little green in the design, or you might choose to use shades of brown and other earthen tones to dress it up. You don’t have to choose one style of plant, either. 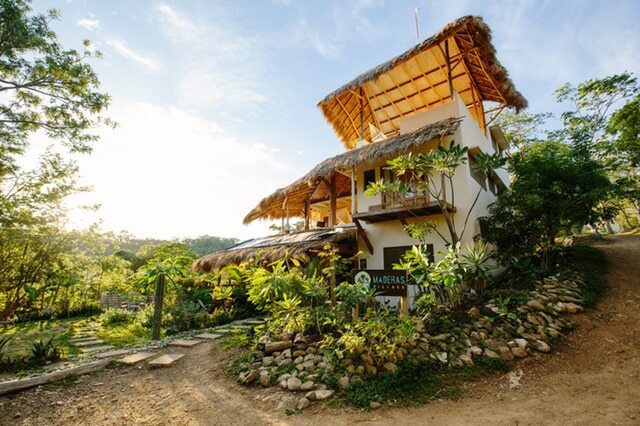 Here, the gardener infused tropical plants and exotic flowers into a natural stone garden sourced locally. It’s eye catching to start with, but when you realize you can sit just above the gentle slope in the rattan furniture and gaze on it whenever you like, you’ll be smitten. The fact that you probably don’t have enough room for a vineyard shouldn’t weigh on the actual design. 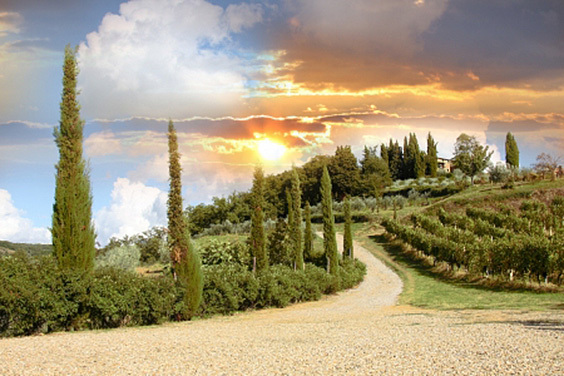 While you may not be able to grow lovely Chianti grapes, you can still take a landscaping approach that brings the lovely Tuscan winery vineyards to you. 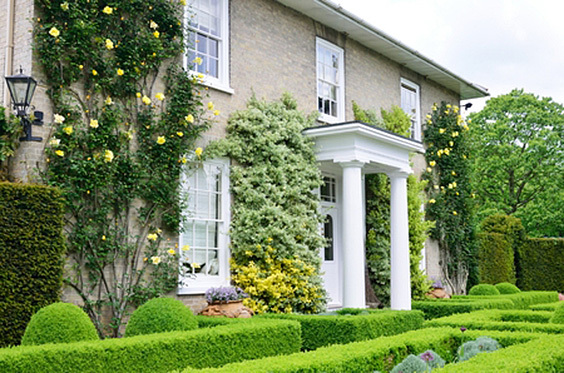 Sculpted rows of small bushes and a pebble path lined with austere, thin trees can really bring home a taste of Italy. 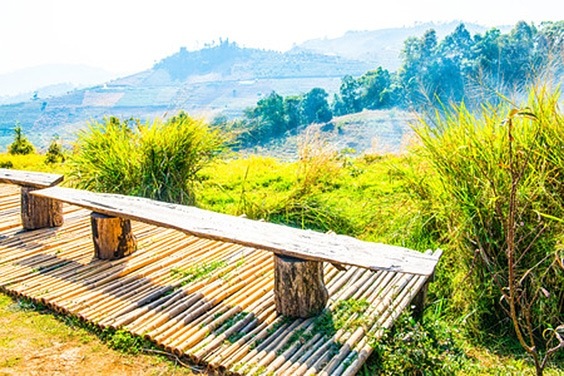 Have you ever considered building a deck out of bamboo? You don’t have to make it fancy, and you don’t have to furnish it with brand new teak. Actually, it may be more exciting to take a minimalistic approach, with no railing and no individual seating. Find a few stumps, and find some old two by tens you can use to build the most magnificent, rugged rustic benches from which to enjoy the view. 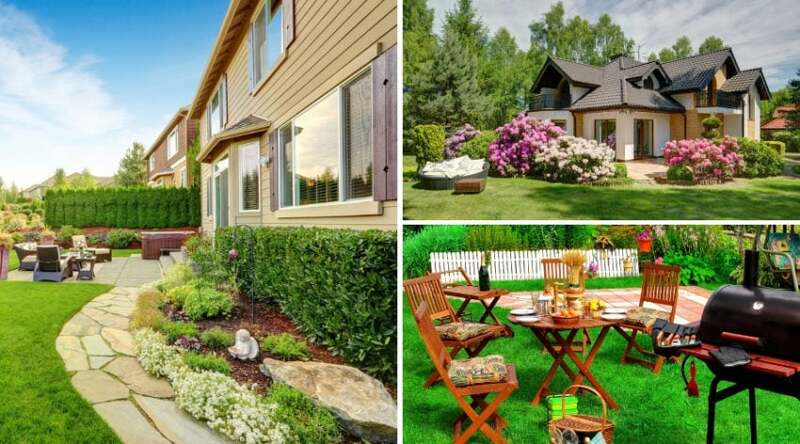 What’s unique about your yard space now? What can you change to make it unique? Consider clearing a space in the midst of a large thatch of perfectly manicured scrubs to make an abstract design. 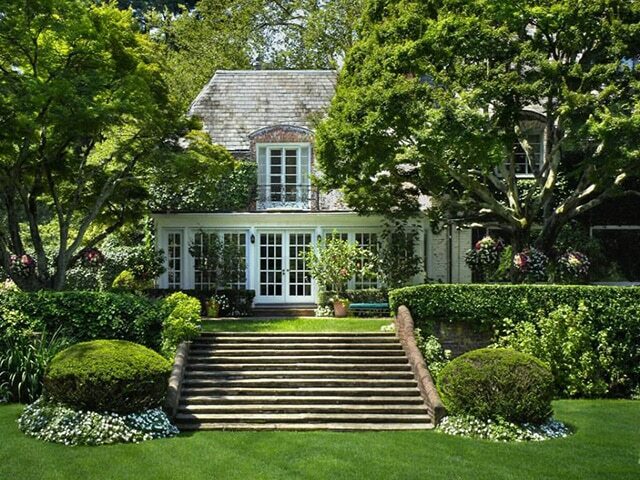 Or, add a single tall tree with thick foliage atop a section of hedges that are flawlessly trimmed. Keep your design bare bones, and it will speak boldly for itself. Most landscaping without grass return to the concrete jungle or the desert feel. In fact, you can have a luscious, green yard without grass if you take the time to cultivate it. 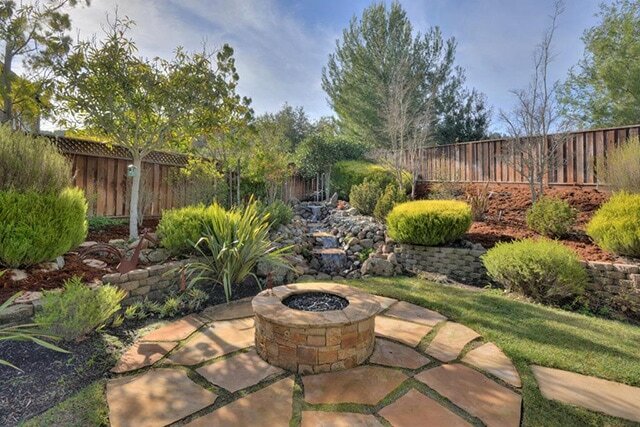 A design mimicking the forest floor can add magic and sparkle in your backyard. You’ll never grow tired of visiting a gem like this, with creeping vines, moss, and rock croppings. When you think of evergreens, you probably think of conifers like pine trees. But some evergreen ideas are based off an entirely different evergreen plant. the cactus. The golden barrel cactus adds an intriguing appearance. and feel. to your outdoor space. Blended with other elements in your yard, they are certainly eye catching. and easy to care for as an added bonus! You don’t have to stick to one species of cactus, either. 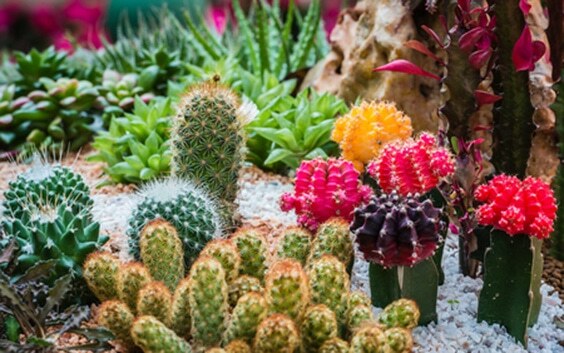 You can create your own colourful garden, even in an incredibly hot and dry climate, by varying the types of cacti you plant. Many of them will actually bloom, too. None of these need a great deal of space to grow due to their environmental adaptations, so even if you have a small area for growth, they can make a big difference in your landscape. While a lot of people don’t stop to consider artificial grass, you could really benefit from a design incorporating the material. 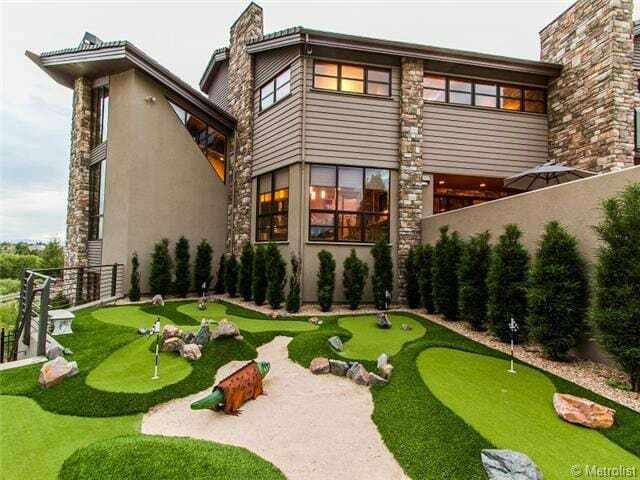 Use it for your own personal putting green in an otherwise pebbled yard, where you have a drier climate. A stone table and benches on your patio overlooking it can match up nicely and make it a more family style environment. Pebbles aren’t just the tiny stones you find in creek beds anymore. You can purchase large bags of multicoloured pebbles for use in your yard, making any pebble landscaping design ideas you have easier to manifest. Use them to fill in around decorative rocks, to line the bottom of a small pond, or to dress up areas of your yard where it’s hard to grow grass. With Grecian columns pronouncing the pergola top, a weaved wicker coffee table, and a lounging couch, the only thing missing from the scene to make you feel like a Greek god is a beautiful bunch of grapes. Or maybe a glass of wine. Create the perfect, peaceful snooze spot on your patio to kick up the appeal of your landscaping area. 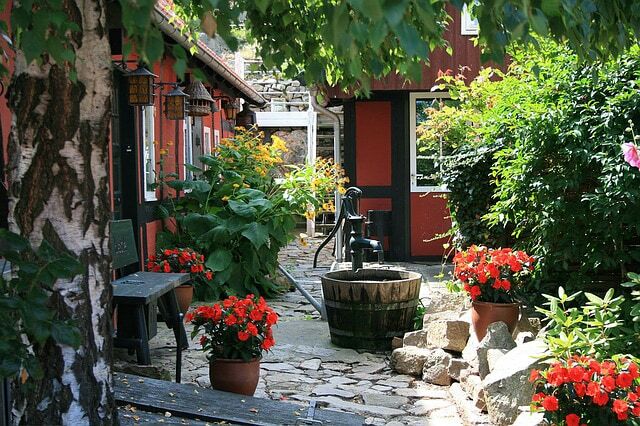 A small yard doesn’t have to look small, and you don’t have to give up a lot of ideas to save space. With layered levels that bring out different plant heights, you can make a small space look larger. Just like high ceilings in a small room open it up, elevating plants to make them seem taller at the end of your yard space can increase the perceived depth of your landscaping area. If you have a lot of space and the weather to support greenery, but you don’t particularly have great soil, you can compensate by blending your vegetation with urban style design. The use of brick and tile to create a patterned area, with elevated planters full of flowers and a couple of trees, may be just what the doctor ordered to give you enough green space while adapting to your environment in a stylistic way. 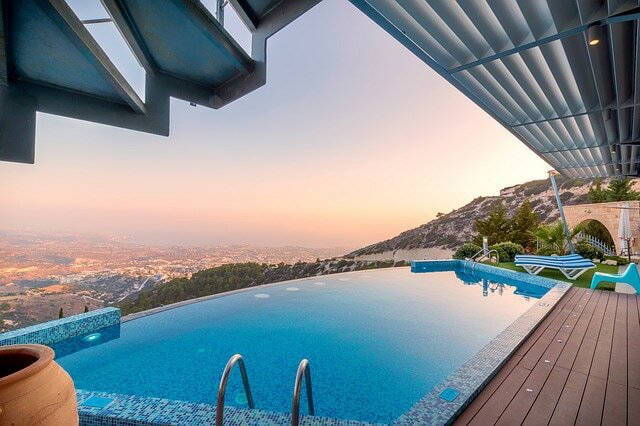 No one said you couldn’t live the high life in your outdoor space. 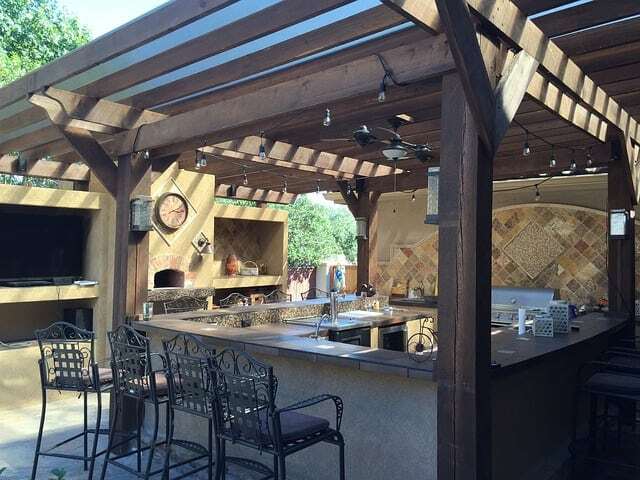 Rather than planting a bunch of greenery that might be difficult to care for, maybe the best landscaping opportunity for you is to install an entire outdoor kitchen under a pergola, including a bar area. This is especially great if you do a lot of entertaining and like to grill. 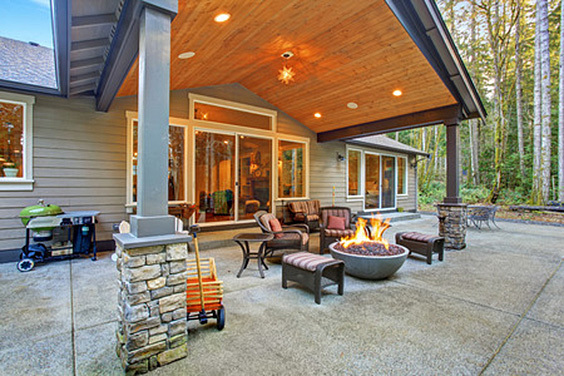 Not having a traditional yard space doesn’t excuse you from designing the outdoor space available to you. 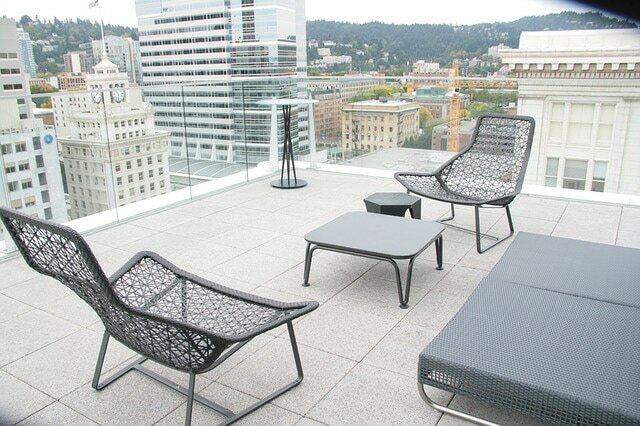 Even if you live in a flat in the big city, roof access gives you the opportunity to build out a fine patio style space. Cozy chairs, a nice table for drinks and food, and even a small fire pit might be the perfect addition to your rooftop design. The use of red and white blooms against a green backdrop is dramatic in any space, large or small, and you can match it to any style home. Roses are a good choice for the brilliant blooms, but choose any breed you like. The terra cotta tile is a somewhat neutral background for the other colors, the tone earthen, but it gives a little added texture to the rest of the design as well. 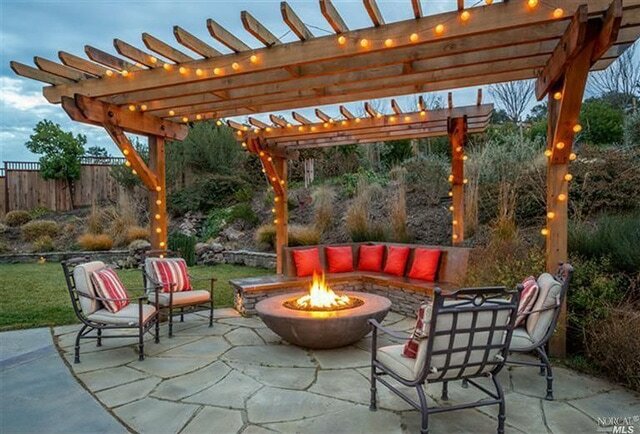 Fire bowls make any space cozy year-round, especially if they are fuelled by natural gas or propane. Add mix and match cozy seating in a semicircle around the blaze and a set of fire glass in the bowl for a splash of bright, glistening color, and you have a patio or deck space that stays warm and inviting year-round. 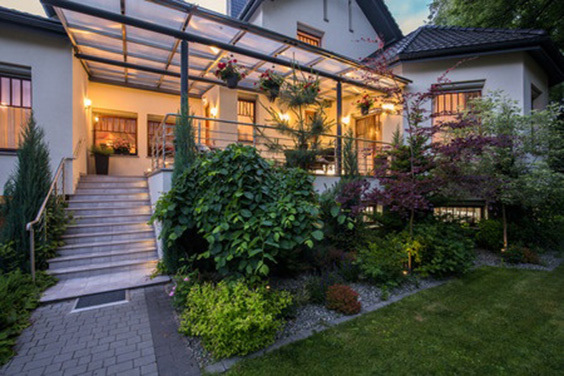 Add some sunken lighting to your awning for ambience. 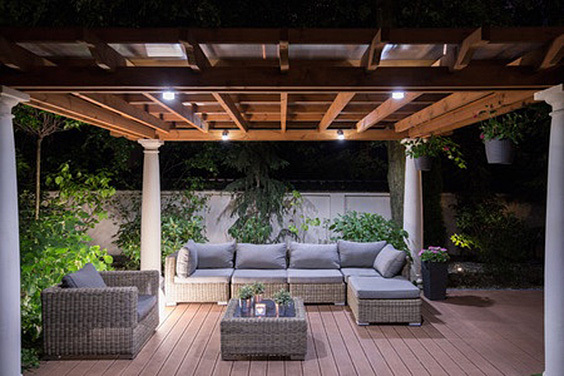 If you’re a night owl, you probably enjoy being on your deck or patio after dark, but it can be difficult to entertain without proper lighting. Install specialized lamps in your covered seating area that illuminate the conversation space while still allowing the night to deepen around you and seep into your mind and body for your own comfort. If it works for shrubs, it works for cacti. The dramatic in size and structure between certain species can really have a dramatic effect on your landscape. 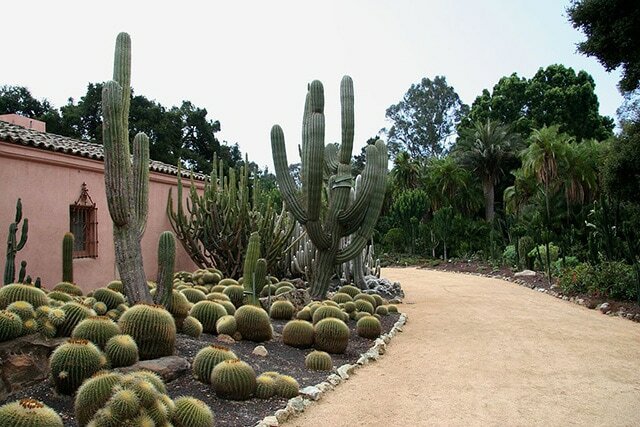 Use the smaller cacti for ground cover with the taller cacti reaching up above. 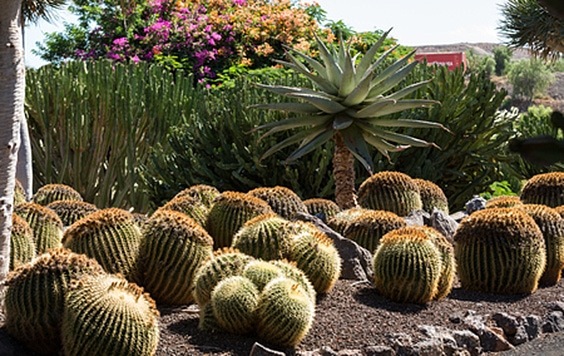 Have cacti with thicker growth of limbs act as trees in the background to mimic the look of a typical landscape of green space. 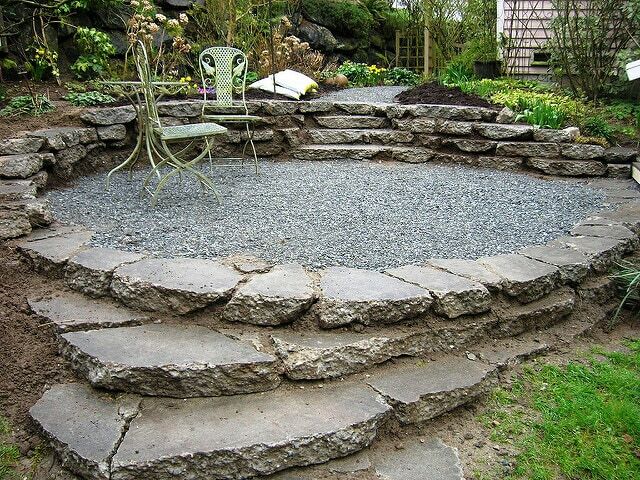 Having a seating platform surrounded by layers of rock that act as stair steps can work for large or small yard spaces. Simply change the size of the circle to accommodate for your area. Cover the floor of the staging area with pebbles or gravel, and add wrought iron or wooden furniture to suit your taste. A leafy, green space as a backdrop works perfectly for this peaceful retreat. 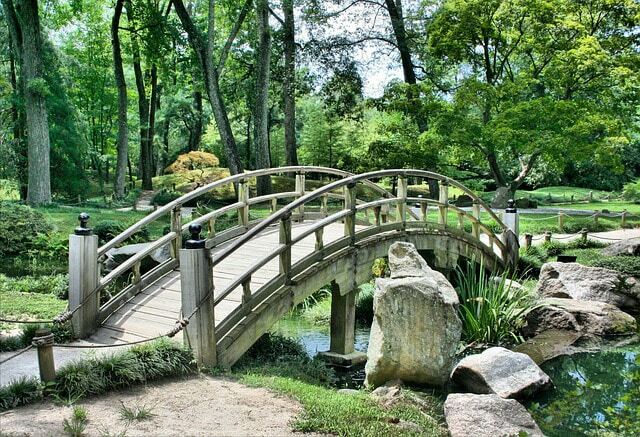 One of the most common elements in Japanese landscaping is the bridge, and whether you have a large garden area and can erect a big structure or maybe just a small pond where you can install a miniature version, adding a decorative bridge to your landscaped yard gives it a magical aura, with the imaginative impression that crossing the bridge will take you into a separate paradise. 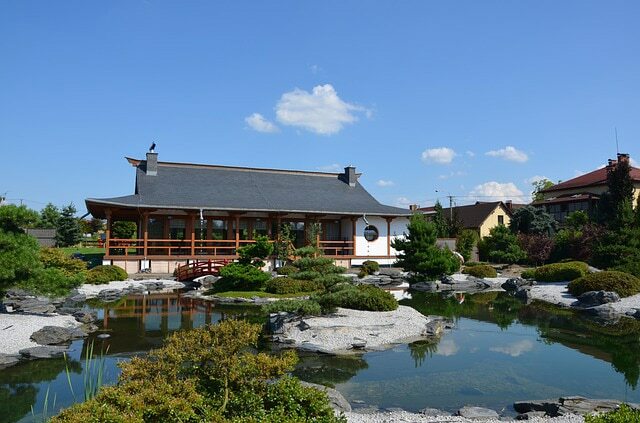 Other elements of Japanese landscaping include lots of water ponds, stone outcroppings, and small trees (think carefully manicured Bonsai trees). You can even add a deck to your home with elements of traditional Japanese temples, like the shape of overhangs and the stain on the wood of the patio, to complete the overall effect. It makes a great space for meditation and stress relief. Laying stones, pebbles, and concrete don’t require the surface to be perfectly flat or to line up in right angles. Try adding some texture and pattern to the concrete, and make your cobblestone path random and winding rather than straight. If you’re looking to add a cleaner element, trim the bushes into a perfect shape, adding a sense of organization if you don’t like chaos. 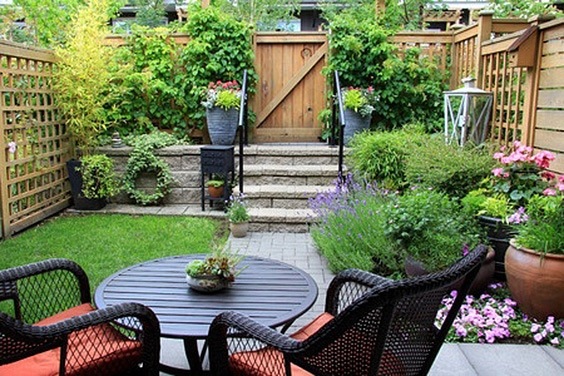 Even if you don’t have a yard, you can use a porch, patio, deck, or balcony to landscape. 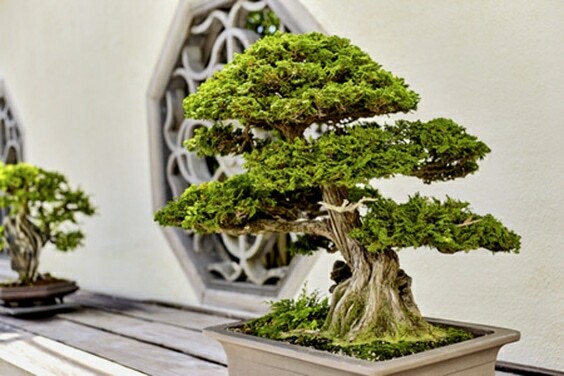 In limited space, a Bonsai tree or two can really add style to an otherwise drab area. 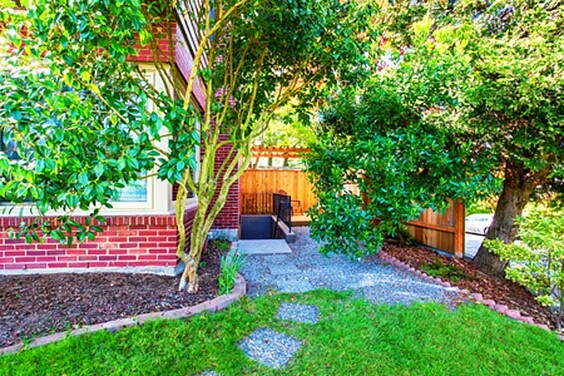 Especially in apartments with no yard space, you can still enjoy the act of occasional pruning and shaping of the trees, and it makes for a great Zen garden in a tiny space. Choose your decorative pot to increase the aesthetic appeal. 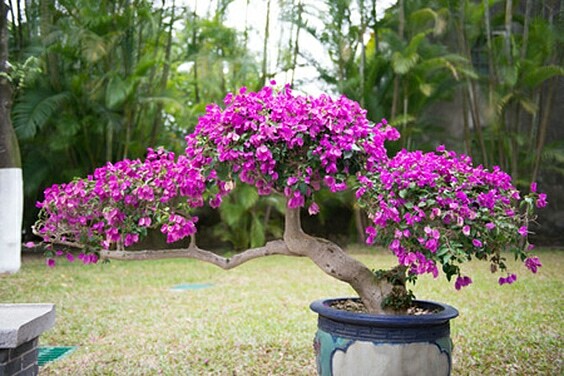 If we’re discussing miniature trees, consider adding a flowering Bonsai to your garden or deck. The shape and brilliant purple color of the plant and its blooms really boosts the level of design and can even increase your mood. Make it a centerpiece in a wood or concrete space, or use it as a dramatic addition to your garden entryway. 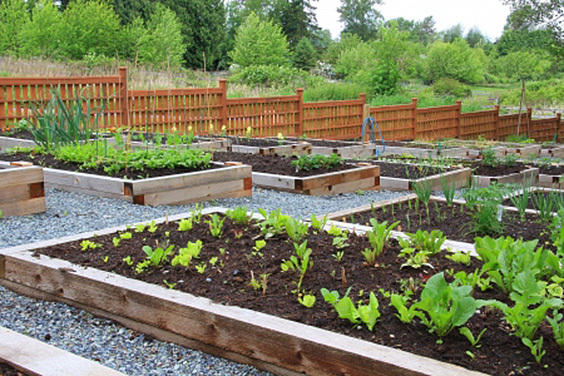 A traditional vegetable garden is a great use of yard space, but that doesn’t mean it has to look boring. 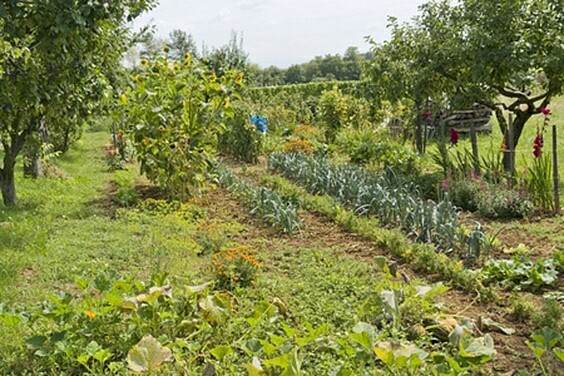 There are plenty of interesting vegetable gardens to consider. 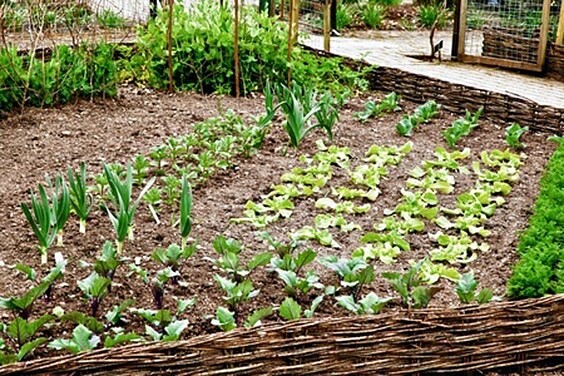 Use logs to line the outside, and plant rows at an angle to create a dramatic space in which vegetables of different colors grow in rainbows. Vary the textures from one row to the next. It will help you stay organized without making the design too basic. Some areas of the country suffer from a lack of nutrient rich soil, and others have a layer of thick red or black clay that requires a great deal of effort to dig through before you can garden. 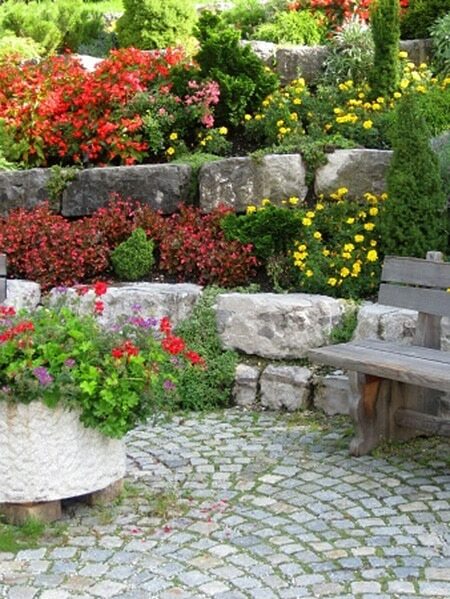 Avoid the trouble by covering your yard with pebbles or gravel and using permanent planting boxes for your greenery. This works for gardens or simply beautiful and organized landscaping. If your backyard space leads to a wooded area, you may want to simply create a landscaping design that blurs the line between your property and the natural elements. This idea makes your world stretch beyond the confines of your home and into the wilderness. Exploring ground cover can help you decide the best way to mimic the forest floor as part of your outdoor area. 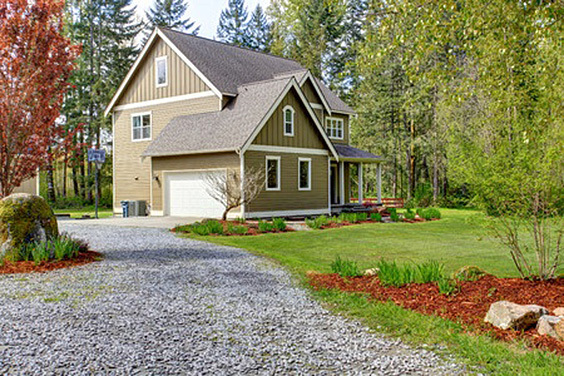 While there may not be a lot of gravel driveway ideas out there, you can still find a way to make your home unique. 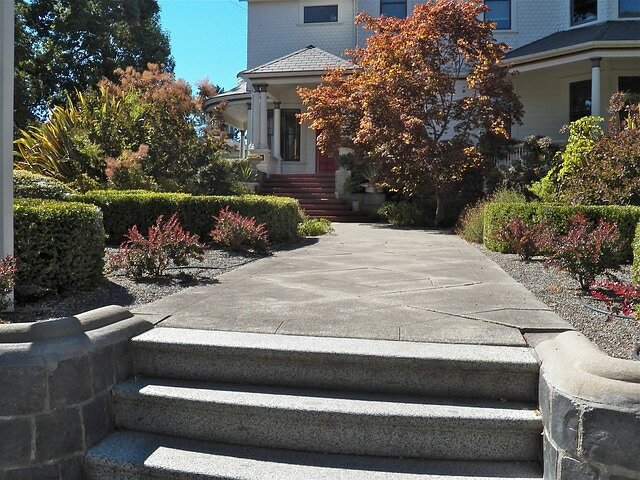 Choose the color of your gravel to make your home stand out, and outline with brilliant white stones. Use a dark or bright mulch in the yard to contrast the color of the gravel and make both elements stand out in their own way. If you’re a stickler for a clean lawn, make sure you plant grass that cleans up well when mown short. You can keep a pristinely manicured lawn and back it with perfectly pruned shrubs so that you have an immaculate outdoor space at all times. Choose shrubs that tend to maintain their shapes with few juts so that care and maintenance are a little easier for you. We’ve all seen the concrete barricades on freeways, but what if these blocks looked more natural? It might feel a little less imposing and make a ‘boulder’ statement. Here, with large natural stones lining either side of the driveway inspire respect and awe without seeming intimidating or unwelcoming. 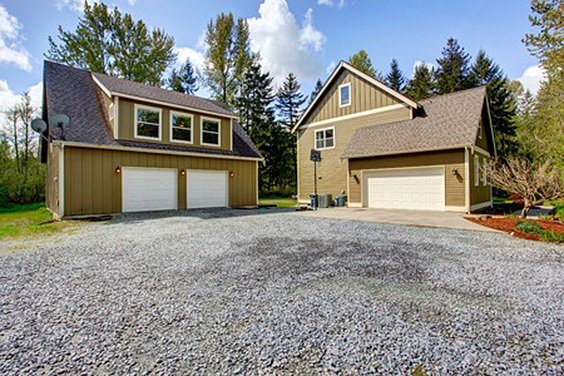 Match stones to the color of your siding or gravel, or purposely choose a color that stands out in contrast. In a lot of open space where grass abounds, the need for color might tickle at the back of your neck. But with so much space, taking care of tons of flowering plants can be a nightmare. Consider using mulch. There is little care needed for mulched areas of a yard, especially if you put them where grass doesn’t grow easily, and you can choose from a variety of bright colors to break up the monotony of your yard. Living in the country equates to having a great deal of land, and maybe you’d like some simple space that doesn’t require a lot of maintenance, since you already have a huge backyard. 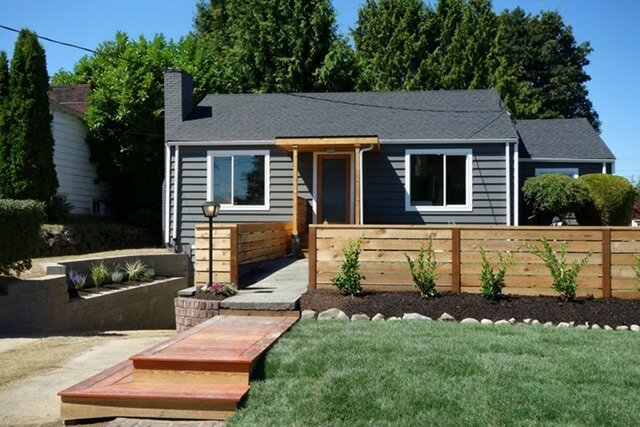 Instead of trying to plant additional items out front, raze the area and lay out some nice gravel. When you choose the right color and texture, you’d be amazed how beautiful it can really look. If you have an area you need to fence and aren’t looking for a privacy fence, you can get creative with the design by choosing a different sort of fence. Instead of chain link, opt for something metal with a pattern, letting the greenery show through while also bringing in style. This works for short or tall fences in big or small enclosures. Maybe you like the idea of chain link fencing but you’re looking to dress it up a little. Try a sturdier metal with a design, including a possible touch of color here and there. 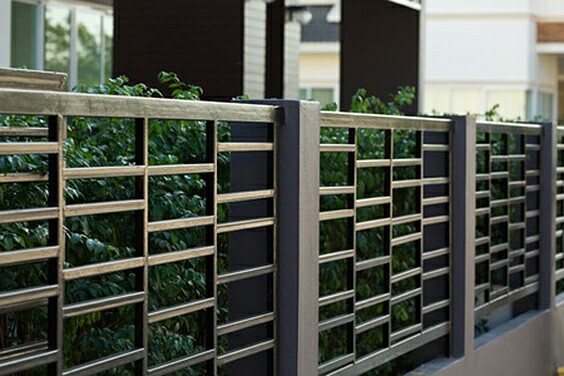 Especially if you have the hint of a shade of something other than green in your ground cover, you can reflect that in the detailing of the fence you choose. There are also ways to get the privacy you’re looking for in your yard without having a typical privacy fence built. A lot of backyard landscaping ideas for privacy revolve around the use of bushes and thick shrubs that grow taller than your fence. 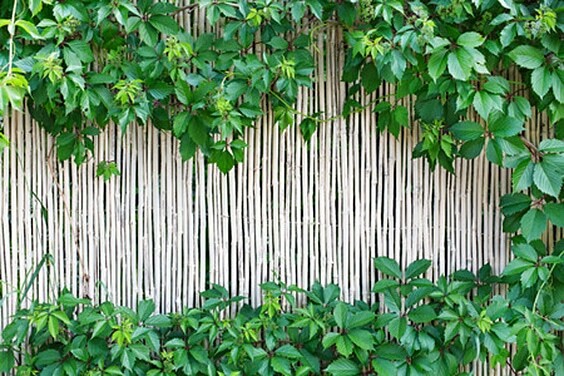 Take this idea and update it with a sturdy, stylistic bamboo fence. It’ll make your landscape stand out without exposing your yard. Sometimes, it seems like there’s nothing you can do to work with the bright color of red brick, but there are several landscaping ideas for red brick houses that make the deep red more subtle. Balance the red with lots of green, using trees with light green leaves that grow limbs widespread. Plant a similar light coloured grass, and consider adding some dark brown mulch in your plant beds for contrast. If the front of your house gets too much sunlight throughout the day, it can affect your landscaping choices as well as your cooling bill. The addition of a shade tree in a strategic location can make a big difference. It breaks up a stark landscape, helps provide more options for planting, and reduces the radiant heat that costs you more electricity to combat. Maples are great choices for shade trees. 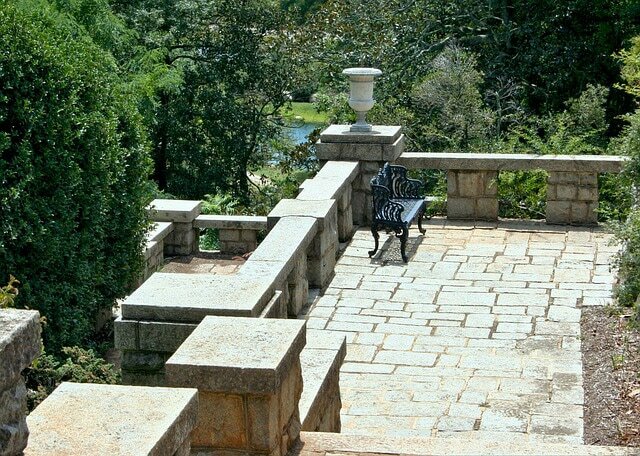 You probably haven’t thought about decomposing granite, but the material can be just what the doctor ordered for your outdoor space. Walls, patios, and more can be created from the granite, and the shade you choose can change the entire look of your yard. Try matching your furniture to the color of the granite for a more cohesive design. You don’t have to go crazy with the foliage to impress the neighbourhood. Adding a few small shrubs to the outline of your house or driveway can be enough, especially if you use a variety of species and simply plant one of each. The broad spectrum of different plants keeps the design interesting while also making it simpler for you to maintain, without as many green things to take care of. A lot of modern home designs have an office studio or a dining room with a large window in the front of the house, and this is where the sun streams in and heats things up to an uncomfortable level. It also provides a large eye right into the core of your home for everyone to see. 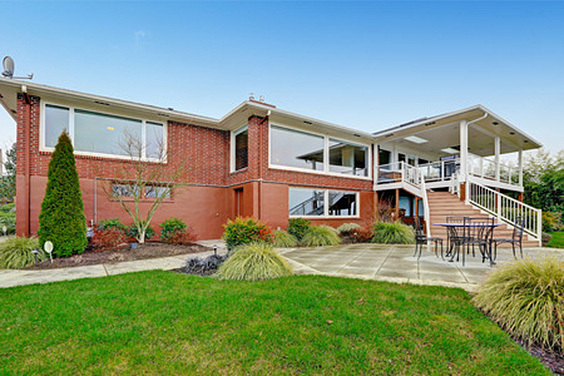 A subtle shade tree placed in front of that window allows you to still have visibility from the inside while blocking excess heat and prying eyes. And it accomplishes all this in a beautiful way. A dual-level outdoor space would be dreamy, especially if you could build it to have a protected area underneath, out of the sun and wind, with an upper level that, while covered, still invites in the beauty of nature. Make sure your stairs aren’t too steep, and consider perhaps adding a ramp. But be sure you have plenty of ways to access the area from inside. 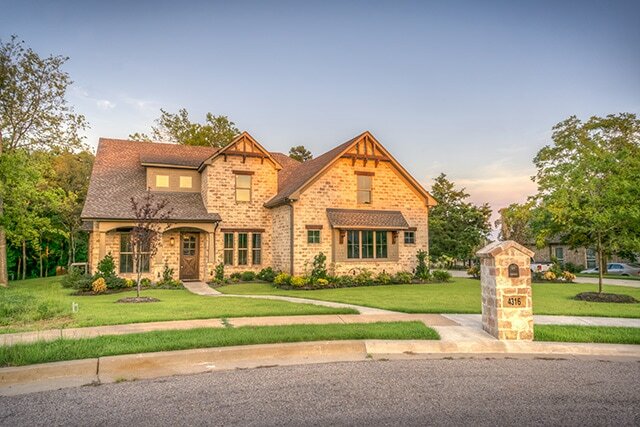 A thick brick fence gives the feeling of complete seclusion, and the décor should be just as ornate. Thus, the pillars with blur orbs which look much like globes. Center a seating area, perhaps with a fire pit, in the area, and you’ll feel like you’ve got the whole world in your hands every time you step outside. Add some brilliantly coloured pottery or sculptures for show. 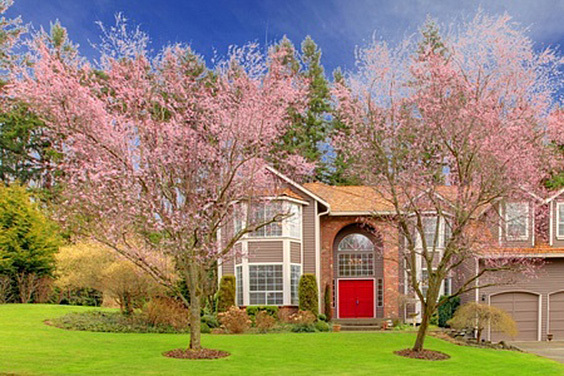 If you like the idea of partial seclusion, consider planting a couple of cherry blossoms in your front yard. They bloom in a thin layer of pretty pink, which helps haze over the view to your home for outsiders looking in while keeping the option to gaze out your window at the world going by wide open. And if you decide it’s too much, just trim it back a little for greater visibility. 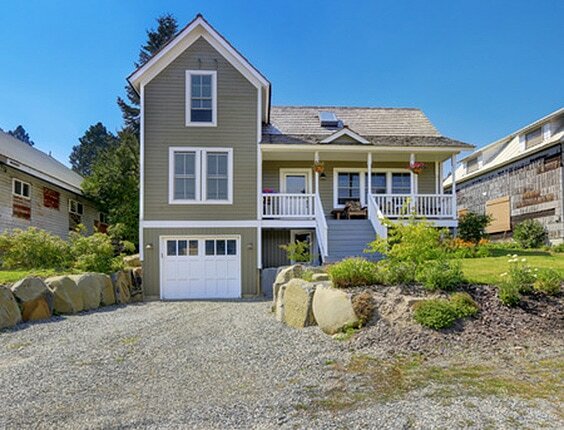 The quaint Victorian home seems to dictate a specific type of landscaping. 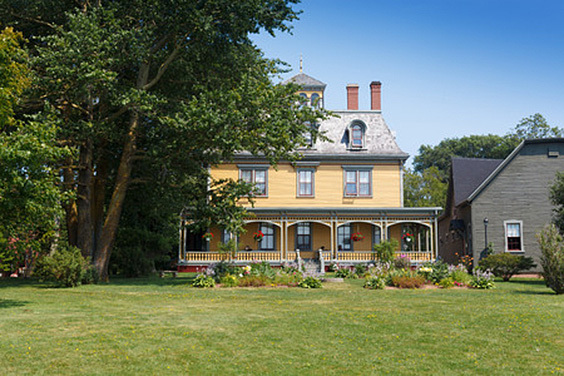 Most Victorian landscaping ideas are very simple, keeping clean lines around the home and assuring that the wraparound porch is the focal point of the entire home. backing it with thick trees really sets off the impressive look of the house, and a few small, well manicured shrubs along the bottom of the veranda keep it simple. 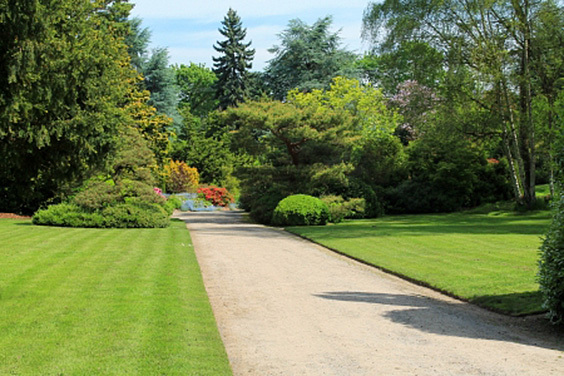 For a large estate, you’ll probably need to consider a number of different approaches, including ideas for slopes. 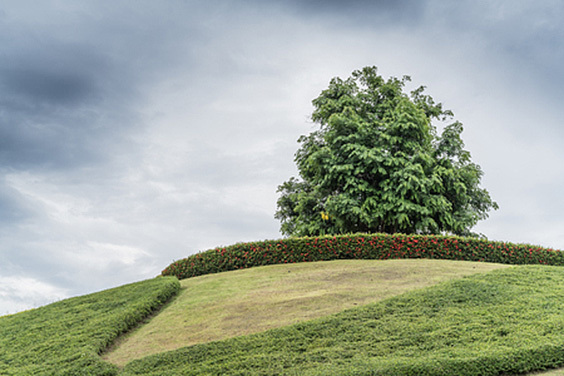 Make the landscape seem even by growing trees and shrubs to different heights, keeping the tops trimmed evenly. Or, let them all grow to the same height to show the gradual downhill motion of the land in a rolling sweep. 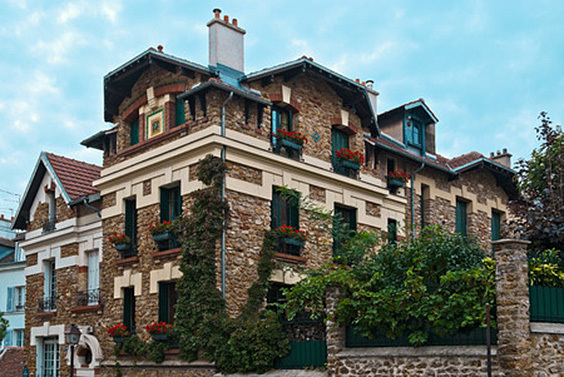 Use greenery to make your house look like it stands taller than it actually does. In fact, you can have your home appear to float above the ground with the right sort of bushes planted at proper intervals. Rock walls can also accomplish this little trick on the eye, which adds up to your house actually seeming to be quite a bit larger than it actually is. If you have a wraparound porch, you may want to consider something a little different in your landscaping design. rather than planting all the way around the house, you can use planters, both seated and hanging, to bring life to your landscape. You can switch them around when you like to change up the scenery, and you can easily bring in plants that won’t live through the winter. 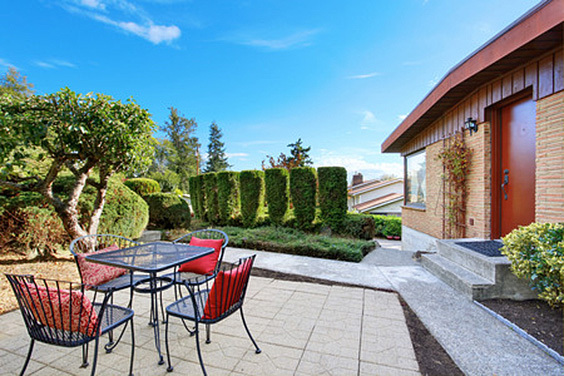 If you have a lot of land, you could always get creative and build your own hedge maze. Consider a rose bush labyrinth as well, adding splashes of color to the controlled chaos. So many people will enjoy wandering through the rows and seeking out different ways to find the exit, and you can get lost in your own paradise. Now that you have too many landscaping ideas to make sense of rolling around in your head, stop to think about your own front and back yards. What appeals to you, and how much space do you have to apply a design? What sort of climate are you working with? 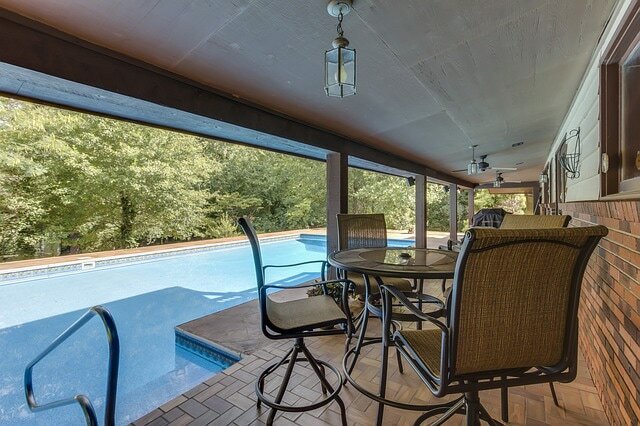 Is there a possibility of adding a pool or deck, or do you already have one? Once you start asking and answering questions, you’ll be able to sort out the elements that suit you, your preferences, and your application best. I you have any ideas of your own to share, feel free to comment below! 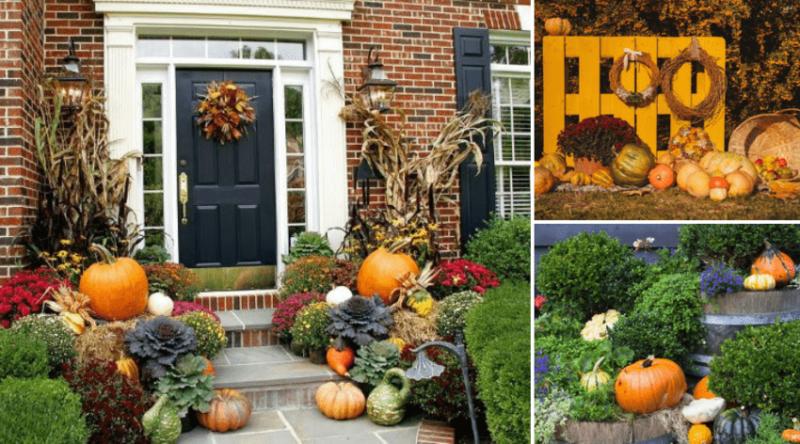 *You might also like: 22 of The Best Fall Landscape Ideas?